Compositions comprising a fatty acid oil mixture and at least one free fatty acid in a coated capsule or a coated tablet form suitable for oral administration, and methods of use thereof, are disclosed. Further disclosed are preconcentrates comprising a fatty acid oil mixture, at least one surfactant, and optionally at least one free fatty acid, in a coated capsule or a coated tablet form, and methods of use thereof. The preconcentrates are capable of forming a self-nanoemulsifying drug delivery system (SNEDDS), a self-microemulsifying drug delivery system (SMEDDS), or self-emulsifying drug delivery systems (SEDDS) in an aqueous solution. This application claims priority to U.S. Provisional Application No. 61/254,291 , filed on October 23, 2009, U.S. Provisional Application No. 61/254,293, filed on October 23, 2009, and U.S. Provisional Application No. 61/254,296, filed on October 23, 2009, all of which are incorporated herein by reference in their entireties. The present disclosure is generally directed to compositions and preconcentrates comprising a fatty acid oil mixture in a coated capsule or a coated tablet form suitable for oral administration, and methods of use thereof. The capsules and tablets presently disclosed may be administered to a subject for therapeutic treatment and/or regulation of at least one health problem including, for example, irregular plasma lipid levels, cardiovascular functions, immune functions, visual functions, insulin action, neuronal development, hypertriglyceridemia, hypercholesterolemia, mixed dyslipidemia, heart failure, and post myocardial infarction (Ml). atherosclerotic disease, and related conditions. In fact, NCEP ATP III specifies non- HDL cholesterol reduction as a treatment objective. Omega-3 fatty acids may regulate plasma lipid levels, cardiovascular and immune functions, insulin action, and neuronal development, and visual function. Marine oils, also commonly referred to as fish oils, are a source of omega-3 fatty acids, including eicosapentaenoic acid (EPA) and docosahexaenoic acid (DHA), have been found to regulate lipid metabolism. Plant-based oils and microbial oils are also sources of omega-3 fatty acids. Omega-3 fatty acids may have beneficial effects on the risk factors for cardiovascular diseases, for example hypertension and hypertriglyceridemia, and on the coagulation factor VII phospholipid complex activity. Omega-3 fatty acids may also lower serum triglycerides, increase serum HDL cholesterol, lower systolic and diastolic blood pressure and/or pulse rate, and may lower the activity of the blood coagulation factor Vll-phospholipid complex. Further, omega-3 fatty acids are generally well-tolerated, without giving rise to severe side effects. Several formulations of omega-3 fatty acids have been developed. For example, one form of omega-3 fatty acid oil mixture is a concentrate of primary omega-3, long chain, polyunsaturated fatty acids from fish oil containing DHA and EPA, such as sold under the trademark Omacor® / Lovaza™ / Zodin® / Seacor®. See, for example, U.S. Patent Nos. 5,502,077, 5,656,667, 5,698,594, and 7,732,488. In particular, each 1000 mg capsule of Lovaza™ contains at least 90% omega-3 ethyl ester fatty acids (84% EPA/DHA); approximately 465 mg EPA ethyl ester and approximately 375 mg DHA ethyl ester. polyunsaturated fatty can also be hydrolyzed to free carboxylic acids in vivo. Thus, there remains a need in the art for compositions and/or methods to improve the release and enhance solubilization, digestion, bioavailability and/or absorption of omega-3 fatty acids in vivo, while maintaining the ability to cross cell membranes. It is to be understood that both the foregoing general description and the following detailed description are exemplary and explanatory only and are not restrictive of the present disclosure, as claimed. The present disclosure is directed to a pharmaceutical composition in a gelatin capsule or a tablet form comprising: a fatty acid oil mixture comprising at least 75% eicosapentaenoic acid (EPA) and docosahexaenoic acid (DHA), by weight of the fatty acid oil mixture, wherein the EPA and DHA are in a form chosen from ethyl ester and triglyceride; and at least one free fatty acid; wherein the gelatin capsule or the tablet comprises at least one coating. The present disclosure is also directed to a food supplement or nutritional supplement composition in a gelatin capsule or a tablet form comprising: a fatty acid oil mixture comprising from about 25% to about 75% eicosapentaenoic acid (EPA) and docosahexaenoic acid (DHA), by weight of the fatty acid oil mixture, wherein the EPA and DHA are in a form chosen from ethyl ester and triglyceride; and at least one free fatty acid; wherein the gelatin capsule or the tablet comprises at least one coating. preconcentrate a gelatin capsule or a tablet form comprising: a fatty acid oil mixture comprising at least 75% eicosapentaenoic acid (EPA) and docosahexaenoic acid (DHA), by weight of the fatty acid oil mixture, wherein the EPA and DHA are in a form chosen from ethyl ester, triglyceride; at least one free fatty acid; and at least one surfactant; wherein the gelatin capsule or the tablet comprises at least one coating. The present disclosure is also directed to a pharmaceutical preconcentrate in a gelatin capsule or a tablet form comprising: from about 45% to about 55% by weight, relative to the weight of the preconcentrate, of a fatty acid oil mixture comprising from about 80% to about 88% eicosapentaenoic acid (EPA) and docosahexaenoic acid (DHA) by weight of the fatty acid oil mixture, wherein the EPA and DHA are in ethyl ester form; from about 10% to about 15% by weight, relative to the weight of the preconcentrate, of at least one free fatty acid comprising from about 80% to about 88% EPA and DHA, by weight of the at least one free fatty acid, wherein the EPA and DHA are in free fatty acid form; and from about 30% to about 40% by weight, relative to the weight of the preconcentrate, of at least one surfactant chosen from polysorbate 20; wherein the gelatin capsule or the tablet comprises at least one coating. The present disclosure is also directed to a pharmaceutical preconcentrate in a gelatin capsule or a tablet form comprising: from about 45% to about 55% by weight, relative to the weight of the preconcentrate, of a fatty acid oil mixture comprising from about 80% to about 88% eicosapentaenoic acid (EPA) and docosahexaenoic acid (DHA) by weight of the fatty acid oil mixture, wherein the EPA and DHA are in ethyl ester form; from about 10% to about 15% by weight, relative to the weight of the preconcentrate, of at least one free fatty acid chosen from oleic acid; and from about 30% to about 40% by weight, relative to the weight of the preconcentrate, of at least one surfactant chosen from polysorbate 20; wherein the gelatin capsule or the tablet comprises at least one coating. The present disclosure is also directed to a pharmaceutical preconcentrate in a gelatin capsule or a tablet form comprising: from about 65% to about 75% by weight, relative to the weight of the preconcentrate, of a fatty acid oil mixture comprising from about 80% to about 88% eicosapentaenoic acid (EPA) and docosahexaenoic acid (DHA) by weight of the fatty acid oil mixture, wherein the EPA and DHA are in ethyl ester form; from about 15% to about 20% by weight, relative to the weight of the preconcentrate, of at least one free fatty acid chosen from oleic acid; and from about 10% to about 15% by weight, relative to the weight of the preconcentrate, of at least one surfactant chosen from polysorbate 20; wherein the gelatin capsule or the tablet comprises at least one coating. The present disclosure is also directed to a pharmaceutical preconcentrate in a gelatin capsule or a tablet form comprising: from about 45% to about 55% by weight, relative to the weight of the preconcentrate, of a fatty acid oil mixture comprising from about 80% to about 88% eicosapentaenoic acid (EPA) and docosahexaenoic acid (DHA) by weight of the fatty acid oil mixture, wherein the EPA and DHA are in ethyl ester form; from about 10% to about 15% by weight, relative to the weight of the preconcentrate, of at least one free fatty acid comprising from about 80% to about 88% EPA and DHA, by weight of the at least one free fatty acid, wherein the EPA and DHA are in free fatty acid form; and from about 40% to about 50% by weight, relative to the weight of the preconcentrate, of at least two surfactants chosen from polysorbate 20 and lecithin; wherein the gelatin capsule or the tablet comprises at least one coating. The present disclosure is also directed to a pharmaceutical preconcentrate in a gelatin capsule or a tablet form comprising: a fatty acid oil mixture comprising at least 75% eicosapentaenoic acid (EPA) and docosahexaenoic acid (DHA), by weight of the fatty acid oil mixture, wherein the EPA and DHA are in free acid form; and at least one surfactant; wherein the gelatin capsule or the tablet comprises at least one coating. The present disclosure is also directed to a pharmaceutical preconcentrate in a gelatin capsule or a tablet form comprising: from about 60% to about 70% by weight, relative to the weight of the preconcentrate, of a fatty acid oil mixture comprising from about 80% to about 88% eicosapentaenoic acid (EPA) and docosahexaenoic acid (DHA), by weight of the fatty acid oil mixture, wherein the EPA and DHA are in free acid form; and from about 30% to about 40% by weight, relative to the weight of the preconcentrate, of at least two surfactants chosen from polysorbate 20 and lecithin; wherein the gelatin capsule or the tablet comprises at least one coating. The present disclosure is also directed to a pharmaceutical preconcentrate in a gelatin capsule or a tablet form comprising: a fatty acid oil mixture comprising at least 75% eicosapentaenoic acid (EPA) and docosahexaenoic acid (DHA), by weight of the fatty acid oil mixture, wherein the EPA and DHA are in a form chosen from ethyl ester and triglyceride; and at least one surfactant; wherein the gelatin capsule or the tablet comprises at least one coating. comprising: a fatty acid oil mixture comprising from about 25% to about 75% eicosapentaenoic acid (EPA) and docosahexaenoic acid (DHA), by weight of the fatty acid oil mixture, wherein the EPA and DHA are in a form chosen from ethyl ester and triglyceride; at least one free fatty acid; and at least one surfactant; wherein the gelatin capsule or the tablet comprises at least one coating. The present disclosure is also directed to a food supplement preconcentrate or nutritional supplement preconcentrate in a gelatin capsule or a tablet form comprising: a fatty acid oil mixture comprising from about 25% to about 75% eicosapentaenoic acid (EPA) and docosahexaenoic acid (DHA), by weight of the fatty acid oil mixture, wherein the EPA and DHA are in free acid form; and at least one surfactant; wherein the gelatin capsule or the tablet comprises at least one coating. The present disclosure is also directed to a food supplement preconcentrate or nutritional supplement preconcentrate in a gelatin capsule or a tablet form comprising: a fatty acid oil mixture comprising from about 25% to about 75% eicosapentaenoic acid (EPA) and docosahexaenoic acid (DHA), by weight of the fatty acid oil mixture, wherein the EPA and DHA are in a form chosen from ethyl ester and triglyceride; and at least one surfactant; and wherein the gelatin capsule or the tablet comprises at least one coating. The present disclosure is also directed to a pharmaceutical composition in a gelatin capsule or a tablet form comprising a fatty acid oil mixture comprising at least 75% eicosapentaenoic acid (EPA) and docosahexaenoic acid (DHA), by weight of the fatty acid oil mixture, wherein the EPA and DHA are in a form chosen from ethyl ester and triglyceride, and at least one free fatty acid, wherein the gelatin capsule or the tablet comprises at least one coating, for the treatment of at least one health problem chosen from irregular plasma lipid levels, cardiovascular functions, immune functions, visual functions, insulin action, neuronal development, heart failure, and post myocardial infarction. The present disclosure is also directed to a pharmaceutical preconcentrate in a gelatin capsule or a tablet form comprising a fatty acid oil mixture comprising at least 75% eicosapentaenoic acid (EPA) and docosahexaenoic acid (DHA), by weight of the fatty acid oil mixture, wherein the EPA and DHA are in a form chosen from ethyl ester and triglyceride, at least one free fatty acid, and at least one surfactant, wherein the gelatin capsule or the tablet comprises at least one coating, for the treatment of at least one health problem chosen from irregular plasma lipid levels, cardiovascular functions, immune functions, visual functions, insulin action, neuronal development, heart failure, and post myocardial infarction. The present disclosure is also directed to a self-nanoemulsifying drug delivery system (SNEDDS), self-microemulsifying drug delivery system (SMEDDS), or self-emulsifying drug delivery system (SEDDS) comprising a pharmaceutical preconcentrate in a gelatin capsule or a tablet form comprising: a fatty acid oil mixture comprising at least 75% eicosapentaenoic acid (EPA) and docosahexaenoic acid (DHA), by weight of the fatty acid oil mixture, wherein the EPA and DHA are in a form chosen from ethyl ester and triglyceride, at least one free fatty acid, and at least one surfactant, wherein the gelatin capsule or the tablet comprises at least one coating, and wherein the preconcentrate forms an emulsion in an aqueous solution, for the treatment of at least one health problem chosen from irregular plasma lipid levels, cardiovascular functions, immune functions, visual functions, insulin action, neuronal development, heart failure, and post myocardial infarction. The present disclosure is also directed to a pharmaceutical preconcentrate in a gelatin capsule or a tablet form comprising a fatty acid oil mixture comprising at least 75% eicosapentaenoic acid (EPA) and docosahexaenoic acid (DHA), by weight of the fatty acid oil mixture, wherein the EPA and DHA are in free acid form and at least one surfactant, wherein the gelatin capsule or the tablet comprises at least one coating, for the treatment of at least one health problem chosen from irregular plasma lipid levels, cardiovascular functions, immune functions, visual functions, insulin action, neuronal development, heart failure, and post myocardial infarction. The present disclosure is also directed to a self-nanoemulsifying drug delivery system (SNEDDS), self-microemulsifying drug delivery system (SMEDDS), or self-emulsifying drug delivery system (SEDDS) comprising a pharmaceutical preconcentrate comprising: a fatty acid oil mixture comprising at least 75% eicosapentaenoic acid (EPA) and docosahexaenoic acid (DHA), by weight of the fatty acid oil mixture, wherein the EPA and DHA are in free acid form and at least one surfactantant, wherein the gelatin capsule or the tablet comprises at least one coating, and wherein the preconcentrate forms an emulsion in an aqueous solution, for the treatment of at least one health problem chosen from irregular plasma lipid levels, cardiovascular functions, immune functions, visual functions, insulin action, neuronal development, heart failure, and post myocardial infarction. The present disclosure is also directed to a pharmaceutical preconcentrate in a gelatin capsule or a tablet form comprising a fatty acid oil mixture comprising at least 75% eicosapentaenoic acid (EPA) and docosahexaenoic acid (DHA), by weight of the fatty acid oil mixture, wherein the EPA and DHA are in a form chosen from ethyl ester and triglyceride and at least one surfactant, wherein the gelatin capsule or the tablet comprises at least one coating, for the treatment of at least one health problem chosen from irregular plasma lipid levels, cardiovascular functions, immune functions, visual functions, insulin action, neuronal development, heart failure, and post myocardial infarction. The present disclosure is also directed to a self-nanoemulsifying drug delivery system (SNEDDS), self-microemulsifying drug delivery system (SMEDDS), or self-emulsifying drug delivery system (SEDDS) comprising a pharmaceutical preconcentrate comprising: a fatty acid oil mixture comprising at least 75% eicosapentaenoic acid (EPA) and docosahexaenoic acid (DHA), by weight of the fatty acid oil mixture, wherein the EPA and DHA are in a form chosen from ethyl ester and triglyceride, and at least one surfactant, wherein the gelatin capsule or the tablet comprises at least one coating, and wherein the preconcentrate forms an emulsion in an aqueous solution, for the treatment of at least one health problem chosen from irregular plasma lipid levels, cardiovascular functions, immune functions, visual functions, insulin action, neuronal development, heart failure, and post myocardial infarction. FIG 1 shows the viscosity of preconcentrates A-L.
[031 ] FIG 2 shows the average particle size distribution for preconcentrates A-F, I, and J in gastric media and intestinal media. FIG 3 shows the read out from the Malvern zetasizer for four consecutive measurements on preconcentrate A in gastric media. FIG 4 shows the read out from the Malvern zetasizer for four consecutive measurements on preconcentrate B in gastric media. FIG 5 shows the read out from the Malvern zetasizer for four consecutive measurements on preconcentrate C in gastric media. FIG 6 shows the read out from the Malvern zetasizer for four consecutive measurements on preconcentrate D in gastric media. FIG 7 shows the read out from the Malvern zetasizer for four consecutive measurements on preconcentrate E in gastric media. FIG 8 shows the read out from the Malvern zetasizer for four consecutive measurements on preconcentrate F in gastric media. FIG 9 shows the read out from the Malvern zetasizer for four consecutive measurements on preconcentrate I in gastric media. FIG 10 shows the read out from the Malvern zetasizer for four consecutive measurements on preconcentrate J in gastric media. FIG 1 1 shows the read out from the Malvern zetasizer for four consecutive measurements on preconcentrate A in intestinal media. [041 ] FIG 12 shows the read out from the Malvern zetasizer for four consecutive measurements on preconcentrate B in intestinal media. FIG 13 shows the read out from the Malvern zetasizer for four consecutive measurements on preconcentrate C in intestinal media. FIG 14 shows the read out from the Malvern zetasizer for four consecutive measurements on preconcentrate D in intestinal media. FIG 15 shows the read out from the Malvern zetasizer for four consecutive measurements on preconcentrate E in intestinal media. FIG 16 shows the read out from the Malvern zetasizer for four consecutive measurements on preconcentrate F in intestinal media. FIG 17 shows the read out from the Malvern zetasizer for four consecutive measurements on preconcentrate I in intestinal media. FIG 18 shows the read out from the Malvern zetasizer for four consecutive measurements on preconcentrate J in intestinal media. FIG 19 shows the disappearance of EPA-EE and DHA-EE and the appearance of EPA-FA and DHA-FA during lipolysis of Omacor® . FIG 20 shows the percent recovery of EPA + DHA at different time- points for Omacor®. FIG 21 shows the percent lipolysis of EPA-EE, DHA-EE and total K85EE at different time points for Omacor®. [051 ] FIG 22 shows the disappearance of EPA-EE and DHA-EE and the appearance of EPA-FA and DHA-FA during lipolysis of preconcentrate A. FIG 23 shows the percent recovery of EPA + DHA at different time- points for preconcentrate A. 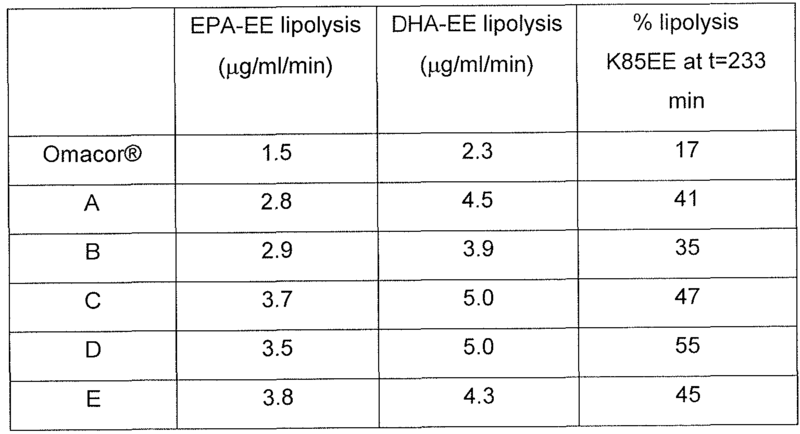 FIG 24 shows the percent lipolysis of EPA-EE, DHA-EE and total K85EE at different time points for preconcentrate A. FIG 25 shows the disappearance of EPA-EE and DHA-EE and the appearance of EPA-FA and DHA-FA during lipolysis of preconcentrate B. FIG 26 shows the percent recovery of EPA + DHA at different time- points for preconcentrate B. FIG 27 shows the percent lipolysis of EPA-EE, DHA-EE and total K85EE at different time points for preconcentrate B. FIG 28 shows the disappearance of EPA-EE and DHA-EE and the appearance of EPA-FA and DHA-FA during lipolysis of preconcentrate C.
 FIG 29 shows the percent recovery of EPA + DHA at different time- points for preconcentrate C.
 FIG 30 shows the percent lipolysis of EPA-EE, DHA-EE and total K85EE at different time points for preconcentrate C.
 FIG 31 shows the disappearance of EPA-EE and DHA-EE and the appearance of EPA-FA and DHA-FA during lipolysis of preconcentrate D.
[061 ] FIG 32 shows the percent recovery of EPA + DHA at different time- points for preconcentrate D.
 FIG 33 shows the percent lipolysis of EPA-EE, DHA-EE and total K85EE at different time points for preconcentrate D.
 FIG 34 shows the disappearance of EPA-EE and DHA-EE and the appearance of EPA-FA and DHA-FA during lipolysis of preconcentrate E.
 FIG 35 shows the percent recovery of EPA + DHA at different time- points for preconcentrate E.  FIG 36 shows the percent lipolysis of EPA-EE, DHA-EE and total K85EE at different time points for preconcentrate E.
 FIG 37 shows the plasma concentration versus time profile of the total lipid concentration of EPA for Example 14. FIG 38 shows EPA blood serum level over time following the administration of coated and uncoated tablets as described in Example 22. 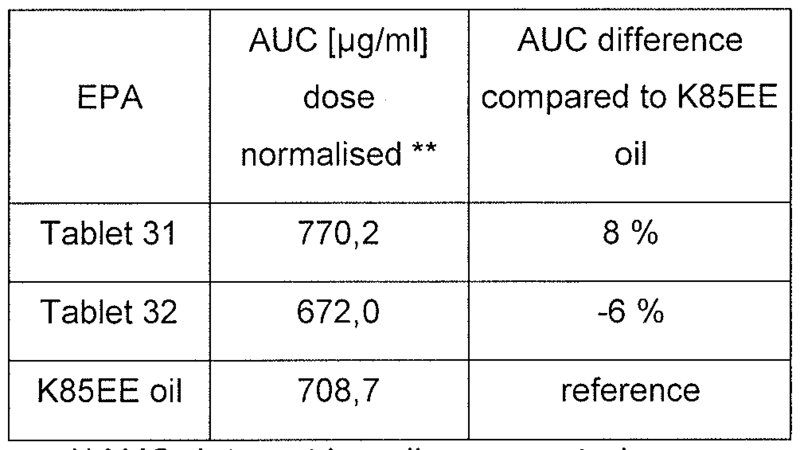 FIG 39 shows DHA blood serum level over time following the administration of coated and uncoated tablets as described in Example 22. Particular aspects of the disclosure are described in greater detail below. The terms and definitions as used in the present application and as clarified herein are intended to represent the meaning within the present disclosure. The patent and scientific literature referred to herein and referenced above is hereby incorporated by reference. The terms and definitions provided herein control, if in conflict with terms and/or definitions incorporated by reference. The singular forms "a," "an," and "the" include plural reference unless the context dictates otherwise. The terms "approximately" and "about" mean to be nearly the same as a referenced number or value. As used herein, the terms "approximately" and "about" should be generally understood to encompass ± 10% of a specified amount, frequency or value. The terms "administer," "administration" or "administering" as used herein refer to (1 ) providing, giving, dosing and/or prescribing by either a health practitioner or his authorized agent or under his direction a composition according to the disclosure, and (2) putting into, taking or consuming by the patient or person himself or herself, a composition according to the disclosure. The present disclosure provides for pharmaceutical and supplement compositions comprising a fatty acid oil mixture and at least one free fatty acid formulated as capsules, e.g., gelatin capsules, and tablets that may be coated. Also disclosed herein are preconcentrates comprising a fatty acid oil mixture and at least one surfactant. In some embodiments, the preconcentrates comprise a fatty acid oil mixture, at least one free fatty acid, and at least one surfactant. The preconcentrates of the present disclosure can produce dispersions of low or very low mean particle size when mixed with an aqueous medium. Such dispersions can be characterized as nanoemulsions, microemulsions, or emulsions. For example, upon delivery, the preconcentrates are thought to produce dispersions with gastric or other physiological fluids generating self-nanoemulsifying drug delivery systems (SNEDDS), self-microemulsifying drug delivery systems (SMEDDS), or self emulsifying drug delivery systems (SEDDS). Compositions of the present disclosure comprise at least one fatty acid oil mixture. The fatty acid oil mixture comprises eicosapentaenoic acid (EPA) and docosahexaenoic acid (DHA). As used herein, the term "fatty acid oil mixture" includes fatty acids, such as unsaturated (e.g., monounsaturated, polyunsaturated) or saturated fatty acids, as well as pharmaceutically-acceptable esters, free acids, mono-, di- and triglycerides, derivatives, conjugates, precursors, salts, and mixtures thereof. In some embodiments, the fatty acid oil mixture comprises fatty acids, such as omega-3 fatty acids, in a form chosen from ethyl ester and triglyceride. In other embodiments, the fatty acids of the fatty acid oil mixture are in free acid form. octadecatetraenoic acid (i.e., stearidonic acid, STA); esters of omega-3 fatty acids with glycerol such as mono-, di- and triglycerides; and esters of the omega-3 fatty acids and a primary, secondary and/or tertiary alcohol, such as, for example, fatty acid methyl esters and fatty acid ethyl esters. The omega-3 fatty acids, esters, triglycerides, derivatives, conjugates, precursors, salts and/or mixtures thereof according to the present disclosure can be used in their pure form and/or as a component of an oil, for example, as marine oil (e.g., fish oil and purified fish oil concentrates), algae oils, microbial oils and plant-based oils. In some embodiments of the present disclosure, the fatty acid oil mixture comprises EPA and DHA. Further for example, in some embodiments, the fatty acid oil mixture comprises EPA and DHA in a form chosen from ethyl ester and triglyceride. In other embodiments, the fatty acid oil mixture comprises EPA and DHA in free acid form. The fatty acid oil mixture of the present disclosure may further comprise at least one fatty acid other than EPA and DHA. Examples of such fatty acids include, but are not limited to, omega-3 fatty acids other than EPA and DHA and omega-6 fatty acids. For example, in some embodiments of the present disclosure, the fatty acid oil mixture comprises at least one fatty acid other than EPA and DHA chosen from a-linolenic acid (ALA), heneicosapentaenoic acid (HPA), docosapentaenoic acid (DPA), eicosatetraenoic acid (ETA), eicosatrienoic acid (ETE), and stearidonic acid (STA). In some embodiments, the at least one fatty acid other than EPA and DHA is chosen from linoleic acid, gamma-linolenic acid (GLA), arachidonic acid (AA), docosapentaenoic acid (i.e., osbond acid), and mixtures thereof. In some embodiments, the at least one fatty acid other than EPA and DHA is in a form chosen from ethyl ester and triglyceride. In other embodiments, the at least one fatty acid other than EPA and DHA is in free acid form. Examples of further fatty acids, or mixtures thereof (fatty acid oil mixtures) encompassed by the present disclosure include, but are not limited to, the fatty acids defined in the European Pharamacopoeia Omega-3 Ethyl Esters 90 and purified marine oils, for example, the European Pharamacopoeia Omega-3 Acid Triglycerides, the European Pharamacopoeia Omega-3 acid Ethyl Esters 60, the European Pharmacopoeia Fish Oil Rich in Omega-3 Acids monograph, and/or for instance, the USP fish oil monograph. Triomega® Cod Liver Oil Blend (Seven Seas); Fri Flyt Omega-3 (Vesteralens); and Epadel (Mochida). Those commercial embodiments provide for various omega-3 fatty acids, combinations, and other components as a result of the transesterification process or method of preparation in order to obtain the omega-3 fatty acid(s) from various sources, such as marine, algae, microbial, and plant-based sources. [081 ] The fatty acid oil mixture according to the present disclosure may be derived from animal oils and/or non-animal oils. In some embodiments of the present disclosure, the fatty acid oil mixture is derived from at least one oil chosen from marine oil, algae oil, plant-based oil, and microbial oil. Marine oils include, for example, fish oil, krill oil, and lipid composition derived from fish. Plant-based oils include, for example, flaxseed oil, canola oil, mustard seed oil, and soybean oil. Microbial oils include, for example, products by Martek. In at least one embodiment of the present disclosure, the fatty acid oil mixture is derived from a marine oil, such as a fish oil. In at least one embodiment, the marine oil is a purified fish oil. In some embodiments of the present disclosure, the fatty acids, such as omega-3 fatty acids, of the fatty acid oil mixture are esterified, such as alkyl esters. The alkyl esters may include, but are not limited to, ethyl, methyl, propyl, and butyl esters, and mixtures thereof. In other embodiments, the fatty acids are chosen from mono-, di-, and triglycerides. In some embodiments, the fatty acid oil mixture is obtained by a transesterification of the body oil of a fat fish species coming from, for example, anchovy or tuna oil, and subsequent physico-chemical purification processes, including urea fractionation followed by molecular distillation. In some embodiments, the crude oil mixture may also be subjected to a stripping process for decreasing the amount of environmental pollutants and/or cholesterol before the transesterification. In another embodiment, the fatty acid oil mixture is obtained by using supercritical C02 extraction or chromatography techniques, for example, to up- concentrate primary EPA and DHA from fish oil concentrates. Commercial embodiments of fatty acids in ethyl triglyceride form encompassed by the present disclosure include, but are not limited to, K85TG (Pronova BioPharma Norge AS). Commercial embodiments of fatty acids in ethyl ester form encompassed by the present disclosure include, but are not limited to, K85EE (Pronova BioPharma Norge AS). In another embodiment, the fatty acid oil mixture is obtained by hydrolyzing a fatty acid oil mixture in ethyl ester form. Commercial embodiments of fatty acids in free acid form encompassed by the present disclosure include, but are not limited to, K85FA (Pronova BioPharma Norge AS). In some embodiments of the present disclosure, at least one of the omega-3 fatty acids of the fatty acid oil mixture has a cis configuration. Examples include, but are not limited to, (all-Z)-9, 12, 15-octadecatrienoic acid (ALA), (all-Z)- 6,9,12, 15-octadecatetraenoic acid (STA), (all-Z)-1 1 , 14, 17-eicosatrienoic acid (ETE), (all-Z)-5,8, 1 1 ,14,17-eicosapentaenoic acid (EPA), (all-Z)-4,7, 10,13,16, 19- docosahexaenoic acid (DHA), (all-Z)-8, 1 1 , 14,17-eicosatetraenoic acid (ETA), (all-Z)- 7, 10, 13,16,19-docosapentaenoic acid (DPA), (all-Z)-6,9, 12,15, 19- heneicosapentaenoic acid (HPA); (all-Z)-5,8, 1 1 , 14-eicosatetraenoic acid, (all-Z)- 4,7, 10,13, 16-docosapentaenoic acid (osbond acid), (all-Z)-9, 12-octadecadienoic acid (linoleic acid), (all-Z)-5,8,1 1 , 14-eicosatetraenoic acid (AA), (all-Z)-6,9,12- octadecatrienoic acid (GLA); (Z)-9-octadecenoic acid (oleic acid), 13(Z)-docosenoic acid (erucic acid), (R-(Z))-12-hydroxy-9-octadecenoic acid (ricinoleic acid). In some embodiments of the present disclosure, the weight ratio of EPA: DHA of the fatty acid oil mixture ranges from about 1 : 10 to about 10:1 , from about 1 :8 to about 8: 1 , from about 1 :6 to about 6: 1 , from about 1 :5 to about 5: 1 , from about 1 :4 to about 4: 1 , from about 1 :3 to about 3: 1 , or from about 1 :2 to 2 about :1. In at least one embodiment, the weight ratio of EPA:DHA of the fatty acid oil mixture ranges from about 1 :2 to about 2:1. In at least one embodiment, the weight ratio of EPA:DHA of the fatty acid oil mixture ranges from about 1 :1 to about 2:1. In at least one embodiment, the weight ratio of EPA:DHA of the fatty acid oil mixture ranges from about 1.2 to about 1 .3. In some embodiments of the present disclosure, the compositions and/or preconcentrates comprise one or more fatty acids, or mixtures thereof, in free acid form. Without being bound by theory, it is believed that fatty acids in free acid form may enhance or improve lipolysis in the body. For example, the addition of at least one fatty acid in free acid form may enhance or improve interconversion of fatty acid esters and/or triglycerides to the free fatty acid form for efficient uptake. Free fatty acids may, for example, provide for enhanced or improved hydrolysis, solubility, bioavailability, absorption, or any combinations thereof of fatty acids in vivo. heneicosapentaenoic acid (HPA), docosapentaenoic acid (DPA), eicosatetraenoic acid (ETA), eicosatrienoic acid (ETE), stearidonic acid (STA), linoleic acid, gamma- linolenic acid (GLA), arachidonic acid (AA), osbond acid, oleic acid, ricinoleic acid, erucic acid, and mixtures thereof, in free acid form. In some embodiments of the present disclosure, the compositions comprise a fatty acid oil mixture in a form chosen from ethyl ester and triglyceride and at least one free fatty acid, such as at least one free fatty acid comprising at least 80% omega-3 fatty acids by weight of the at least one free fatty acid, such as at least 90% omega-3 fatty acids by weight of the at least one free fatty acid. In some embodiments, the compositions comprise a fatty acid oil mixture in a form chosen from ethyl ester and triglyceride and at least one free fatty acid is chosen from oleic acid, ricinoleic acid, linoleic acid, and erucic acid. In one embodiment, the at least one free fatty acid comprises oleic acid or linoleic acid. In some embodiments, the at least one free fatty acid comprises at least 75% EPA and DHA by weight of the at least one free fatty acid. For example, in some embodiments, the at least one free fatty acid comprises at least 80% by weight, at least 85% by weight, at least 90% by weight, or at least 95% EPA and DHA, by weight of the at least one free fatty acid. In some embodiments, the at least one free fatty acid comprises about 80% EPA and DHA by weight of the at least one free fatty acid, such as about 85%, about 90%, about 95%, or any number in between, by weight of the at least one free fatty acid. The at least one free fatty acid can be used in a pure form and/or as a component of an oil, for example, as marine oil (e.g., fish oil and purified fish oil concentrates), microbial oil and plant-based oils. In some embodiments, the at least one free fatty acid comprises from about 75% to about 95% EPA and DHA by weight of the at least one free fatty acid, such as from about 75% to about 90%, from about 75% to about 85%, from about 75% to about 80%, from about 80% to about 95%, from about 80% to about 90%, from about 80% to about 85%, from about 85% to about 95%, from about 85% to about 90%, and further for example, from about 90% to about 95% by weight of the at least one free fatty acid, or any number in between. In at least one embodiment, the at least one free fatty acid comprises from about 80% to about 85% EPA and DHA, by weight of the at least one free fatty acid, such as from about 80% to about 88% EPA and DHA by weight, such as about 84%, by weight of the at least one free fatty acid. In some embodiments of the present disclosure, the fatty acid oil mixture acts as an active pharmaceutical ingredient (API). In some embodiments, the fatty acid oil mixture is present in a pharmaceutically-acceptable amount. As used herein, the term "pharmaceutically-effective amount" means an amount sufficient to treat, e.g., reduce and/or alleviate the effects, symptoms, etc., at least one health problem in a subject in need thereof. In at least some embodiments of the present disclosure, the fatty acid oil mixture does not comprise an additional active agent. Where the composition is a pharmaceutical composition, the fatty acid oil mixture comprises at least 75% EPA and DHA by weight of the fatty acid oil mixture. For example, in one embodiment, the fatty acid oil mixture comprises at least 80% EPA and DHA by weight of the fatty acid oil mixture, such as at least 85%, at least 90%, or at least 95%, by weight of the fatty acid oil mixture. In some embodiments, the fatty acid oil mixture comprises about 80% EPA and DHA by weight of the fatty acid oil mixture, such as about 85%, about 90%, about 95%, or any number in between, by weight of the fatty acid oil mixture. For example, in some embodiments, the fatty acid oil mixture comprises from about 75% to about 95% EPA and DHA by weight of the fatty acid oil mixture, such as from about 75% to about 90%, from about 75% to about 88%, from about 75% to about 85%, from about 75% to about 80%, from about 80% to about 95%, from about 80% to about 90%, from about 80% to about 85%, from about 85% to about 95%, from about 85% to about 90%, and further for example, from about 90% to about 95%) EPA and DHA, by weight of the fatty acid oil mixture, or any number in between. In at least one embodiment, the fatty acid oil mixture comprises from about 80% to about 85% EPA and DHA, by weight of the fatty acid oil mixture, such as from about 80% to about 88%, such as about 84%, by weight of the fatty acid oil mixture. In some embodiments, the fatty acid oil mixture comprises at least 95% of EPA or DHA, or EPA and DHA, by weight of the fatty acid oil mixture. In a further embodiment, the fatty acid oil mixture may comprise other omega-3 fatty acids. For example, the present disclosure encompasses at least 90% omega-3 fatty acids, by weight of the fatty acid oil mixture. In one embodiment, for example, the fatty acid oil mixture comprises from about 75% to about 88% EPA and DHA, by weight of the fatty acid oil mixture, wherein the fatty acid oil mixture comprises at least 90% of omega-3 fatty acids, by weight of the fatty acid oil mixture. In another embodiment, the fatty acid oil mixture comprises from about 75% to about 88% EPA and DHA, by weight of the fatty acid oil mixture, wherein the fatty acid oil mixture comprises at least 90% of omega-3 fatty acids, by weight of the fatty acid oil mixture, and wherein the fatty acid oil mixture comprises a- linolenic acid (ALA). In one embodiment, the fatty acid oil mixture comprises from about 80% to about 88% EPA and DHA by weight of the fatty acid oil mixture, and further comprises docosapentaenoic acid (DPA). [0101 ] In another embodiment, the fatty acid oil mixture comprises from about 80% to about 88% EPA and DHA by weight of the fatty acid oil mixture, and further comprises from about 1 % to about 4% (all-Z omega-3)-6,9, 12, 15, 18- heneicosapentaenoic acid (HPA), by weight of the fatty acid oil mixture. In another embodiment, the fatty acid oil mixture comprises from about 80% to about 88% EPA and DHA by weight of the fatty acid oil mixture; and from 1 % to about 4% fatty acids other than EPA and DHA, by weight of the fatty acid oil mixture, wherein the fatty acids other than EPA and DHA have C20, C21, or C22 carbon atoms. 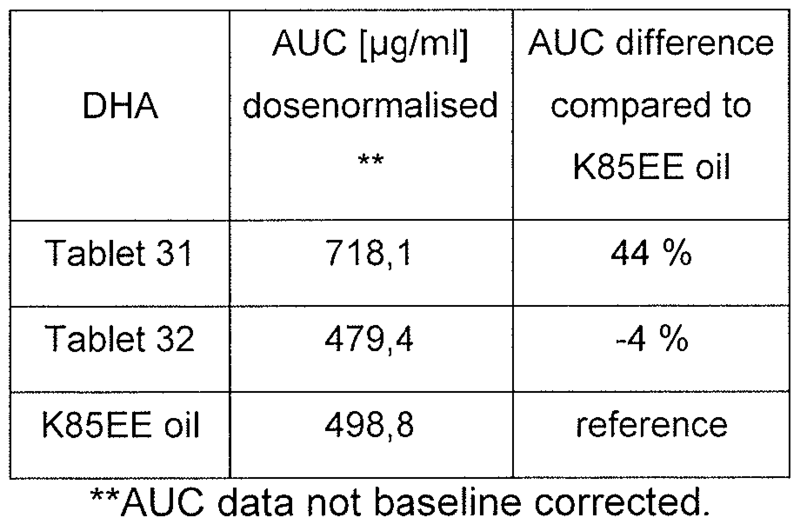 In one embodiment, the fatty acid oil mixture may comprise K85EE or AGP 103 (Pronova BioPharma Norge AS). In another embodiment, the fatty acid oil mixture may comprise K85TG (Pronova BioPharma Norge AS). In yet another embodiment, the fatty acid oil mixture may comprise K85FA (BioPharma Norge AS). [0 04] In some embodiments of the present disclosure, the pharmaceutical compositions provide for enhanced bioavailability, such as greater than about 40% increase in bioavailability, such as, about 80% increase. In at least one embodiment, the fatty acid oil mixture comprises at least 75% EPA and DHA by weight of the fatty acid oil mixture, of which at least 95% is EPA. In another embodiment, the fatty acid oil mixture comprises at least 80% EPA and DHA by weight of the fatty acid oil mixture, of which at least 95% is EPA. In yet another embodiment, the fatty acid oil mixture comprises at least 90% EPA and DHA by weight of the fatty acid oil mixture, of which at least 95% is EPA. In another embodiment, the fatty acid oil mixture comprises at least 75% EPA and DHA by weight of the fatty acid oil mixture, of which at least 95% is DHA. For example, in one embodiment, the fatty acid oil mixture comprises at least 80% EPA and DHA by weight of the fatty acid oil mixture, of which at least 95% is DHA. In another embodiment, the fatty acid oil mixture comprises at least 90% EPA and DHA by weight of the fatty acid oil mixture, of which at least 95% is DHA. The present disclosure further provides a food supplement or a nutritional supplement comprising a fatty acid oil mixture, wherein the fatty acid oil mixture comprises less than 75% EPA and DHA by weight of the fatty acid oil mixture. In some embodiments, for example, the fatty acid oil mixture comprises less than 70% EPA and DHA by weight of the fatty acid oil mixture, such as less than 65%, less than 60%, less than 55%, less than 50%, less than 45%, less than 40%, or even less than 35% by weight of the fatty acid oil mixture. In some embodiments, the fatty acid oil mixture comprises from about 25% to about 75% EPA and DHA by weight of the fatty acid oil mixture, such as from about 30% to about 75%, from about 30% to about 70%, from about 30% to about 65%, from about 30% to about 55%, from about 30% to about 50%, from about 30% to about 45%, from about 30% to about 40%, and further for example, from about 30% to about 35% EPA and DHA, by weight of the fatty acid oil mixture. The present disclosure provides for a preconcentrate composition, wherein the term "preconcentrate" refers to a composition comprising at least a fatty acid oil mixture and at least one surfactant. In some embodiments, for example, the preconcentrate comprises a fatty acid oil mixture in a form chosen from ethyl ester and triglyceride, at least one free fatty acid, and at least one surfactant. In other embodiments, the preconcentrate comprises a fatty acid oil mixture in free acid form and at least one surfactant. In still other embodiments, the preconcentrate comprises a fatty acid oil mixture in a form chosen from ethyl ester and triglyceride and at least one surfactant. [01 10] A surfactant may, for example, lower the surface tension of a liquid or the surface tension between two liquids. For example, surfactants according to the present disclosure may lower the surface tension between the fatty acid oil mixture and an aqueous solution. [01 12] Surfactants are generally classified as ionic surfactants, e.g., anionic or cationic surfactants, and nonionic surfactants. If the surfactant contains two oppositely charged groups, the surfactant is named a zwitterionic surfactant. Other types of surfactants include, for example, phospholipids. [01 13] In at least one embodiment of the present disclosure, the composition comprises at least one surfactant chosen from nonionic, anionic, cationic, and zwitterionic surfactants. [01 14] Non-limiting examples of nonionic surfactants suitable for the present disclosure are mentioned below. commercially-available Pluronic® products are listed in Table 1. 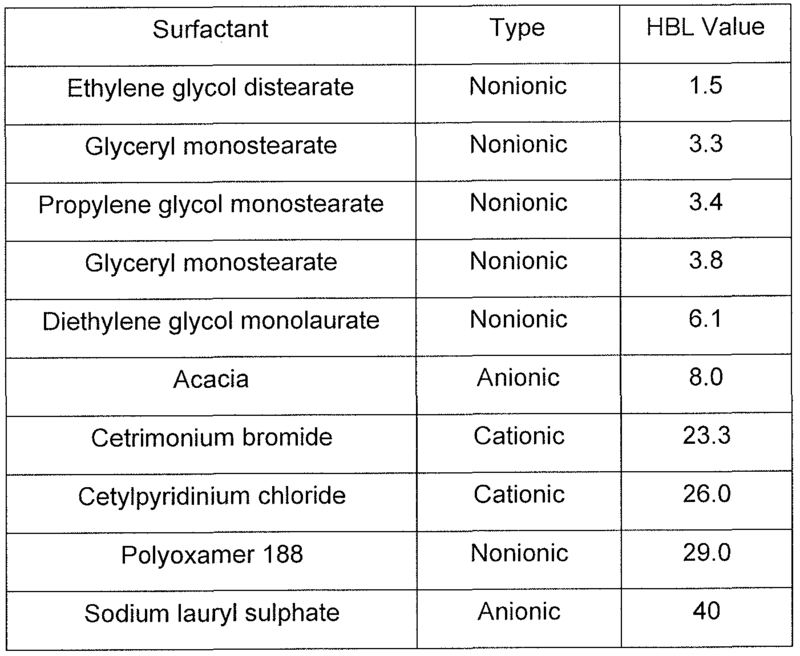 Table 1 : Examples of Pluronic® surfactants. [01 16] Brij® are nonionic surfactants comprising polyethylene ethers. Various commercially-available Brij® products are listed in Table 2. Table 2: Examples of Brij® surfactants. [01 17] Span® are nonionic surfactants comprising sorbitan esters. Span® is available from different sources including Aldrich. Various commercially-available Span® products are listed in Table 3. Table 3: Examples of Span® surfactants. [01 18] Tween® (polysorbates) are nonionic surfactants comprising polyoxyethylene sorbitan esters. Various commercially-available Tween® products are listed in Table 4. 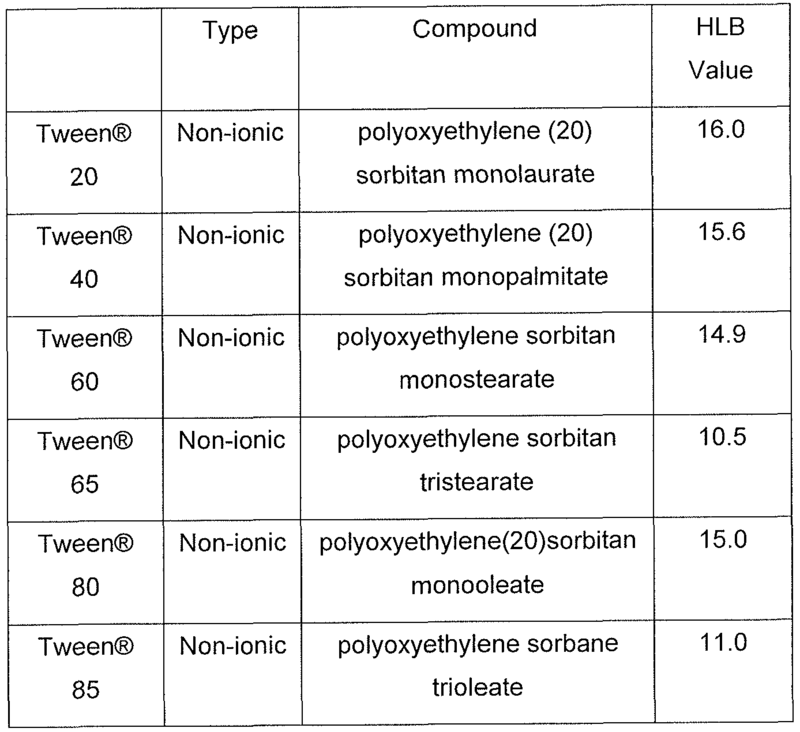 Table 4: Examples of Tween® surfactants. [01 19] Myrj® are nonionic surfactants comprising polyoxyethylene fatty acid esters. Various commercially-available Myrj® products are listed in Table 5. 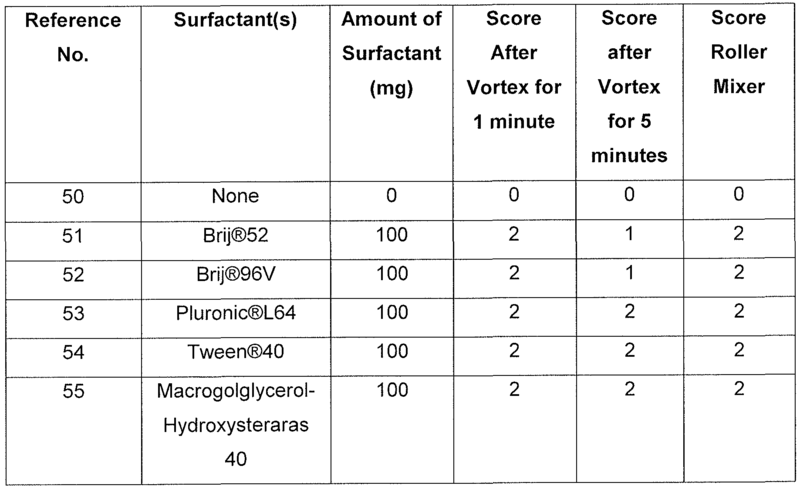 Table 5: Examples of Myrj® surfactants. Cremophor® are nonionic surfactants. Various commercially-available Cremophor® products are listed in Table 6. Table 6: Examples of Cremophor® surfactants. 40 hydrogenated castor oil, propylene glycol diacetate, propylene glycol laurates such as propylene glycol dilaurate and propylene glycol monolaurate. Further examples include propylene glycol monopalmitostearate, quillaia, sorbitan esters, and sucrose esters. Anionic surfactants suitable for the present disclosure include, for example, salts of perfluorocarboxylic acids and perfluorosulphonic acid, alkyl sulphate salts such as sodium dodecyl sulphate and ammonium lauryl sulphate, sulphate ethers such as sodium lauryl ether sulphate, and alkyl benzene sulphonate salts. Cationic surfactants suitable for the present disclosure include, for example, quaternary ammonium compounds such as benzalkonium chloride, cetylpyridinium chlorides, benzethonium chlorides, and cetyl trimethylammonium bromides or other trimethylalkylammonium salts. Zwitterionic surfactants include, but are limited to, for example dodecyl betaines, coco amphoglycinates and cocamidopropyl betaines. didocosahexaenoyl(DHA)choline, phosphatidylethanolamines, phosphatidylglycerols, phosphatidylserines and phosphatidylinositols. Other exemplary phospholipid surfactants include soybean lecithin, egg lecithin, diolelyl phosphatidylcholine, distearoyl phosphatidyl glycerol, PEG-ylated phospholipids, and dimyristoyl phosphatidylcholine. Phospholipids may be "natural" or from a marine origin chosen from, e.g. phosphatidylcholine, phosphatidylethanolamine, phosphatidylserine and phosphatidylinosytol. The fatty acid moiety may be chosen from 14:0, 16:0, 16: 1 n-7, 18:0, 18: 1 n-9, 18: 1 n-7, 18:2n-6, 18:3n-3, 18:4n-3, 20:4n-6, 20:5n-3, 22:5n-3 and 22:6n-3, or any combinations thereof. In one embodiment, the fatty acid moiety is chosen from palmitic acid, EPA and DHA. Other exemplary surfactants suitable for the present disclosure are listed in Table 7. In some embodiments of the present disclosure, the at least one surfactant does not comprise Labrasol, Cremophor RH40, or the combination of Cremophor and Tween-80. In some embodiments, the at least one surfactant has a hydrophilic- lipophilic balance (HLB) of less than about 10, such as less than about 9, or less than about 8. The weight ratio of EPA and DHA to the at least one surfactant may range depending on the choice of surfactant(s), the EPA to DHA ratio, and the overall formulation. In some embodiments of the present disclosure, the weight ratio of EPA and DHA : surfactant ranges from about 10:5 to about 10:0.001 , from about 10:4 to about 10:0.005, from about 10:3 to about 10:0.01 , from about 10:2 to about 0.015, from about 10:2 to about 10:0.02, or from about 10: 15 to about 10:0.03. Co-surfactant [0131 ] In some embodiments, the preconcentrates of the present disclosure further comprise at least one co-surfactant. As used herein the term "co-surfactant" means a substance added to, e.g., the preconcentrate in combination with the at least one surfactant to affect, e.g., increase or enhance, emulsification and/or stability of the preconcentrate, for example to aid in forming an emulsion. In some embodiments, the at least one co-surfactant is hydrophilic. Examples of co-surfactants suitable for the present disclosure include, but are not limited to, short chain alcohols comprising from 1 to 6 carbons (e.g., ethanol), benzyl alcohol, alkane diols and triols (e.g., propylene glycol, glycerol, polyethylene glycols such as PEG and PEG 400), glycol ethers such as tetraglycol and glycofurol (e.g., tetrahydrofurfuryl PEG ether), pyrrolidine derivatives such as N- methyl pyrrolidone (e.g., Pharmasolve®) and 2-pyrrolidone (e.g., Soluphor® P), and bile salts, for example sodium deoxycholate. Further examples include ethyl oleate. In some embodiments, the at least one co-surfactant comprises from about 1 % to about 10%, by weight relative to the weight of the preconcentrate. In some embodiments, the compositions and/or preconcentrates further comprise at least one solvent. Hydrophilic solvents suitable for the present disclosure include, but are not limited to, alcohols, including water-miscible alcohols, such as absolute ethanol and/or glycerol, and glycols, for example glycols obtainable from an oxide such as ethylene oxide, such as 1 ,2-propylene glycol. Other non- limiting examples include polyols, such as polyalkylene glycol, e.g., poly(C2-3)alkylene glycol such as polyethylene glycol. In some embodiments of the present disclosure, the preconcentrate comprises at least one substance that acts both as a co-surfactant and a solvent, for example an alcohol such as ethanol. In other embodiments, the preconcentrate comprises at least one co-surfactant and at least one solvent that are different substances. For example, in some embodiments the preconcentrate comprises ethanol as the co-surfactant and glycerol as the solvent. In some embodiments of the present disclosure, the compositions and/or preconcentrates may comprise at least one superdistintegrant. superdisintegrants include Kollidon® (BASF), Polyplasdone® XL (ISP), and Ac-Di- Sol (FMC BioPolymer). preconcentrates comprising at least one superdisintegrant are in a tablet form. mixture:surfactant of the preconcentrate ranges from about 1 : 1 to about 10:1 , from about 1.1 to about 8: 1 , from 1 : 1 to about 7:1 , from 1 : 1 to about 6: 1 , from 1 : 1 to about 5:1 , from 1 :1 to about 4:1 , from 1 : 1 to about 3:1 , or from 1 :1 to about 2:1. In some embodiments, the at least one surfactant comprises from about 5% to about 55%, by weight relative to the total weight of the preconcentrate. For example, in some embodiments, the at least one surfactant comprises from about 5% to about 35%, from about 10% to about 35%, from about 15% to about 35%, from about 15% to about 30%, or from about 20% to about 30%, by weight, relative to the total weight of the preconcentrate. The preconcentrate of the present disclosure may be in a form of a self-nanoemulsifying drug delivery system (SNEDDS), a self-microemulsifying drug delivery system (SMEDDS), or a self emulsifying drug delivery system (SEDDS), wherein the preconcentrate forms an emulsion in an aqueous solution. [0141 ] Without being bound by theory, it is believed that the preconcentrate forms a SNEDDS, SMEDDS, and/or SEDDS upon contact with gastric and/or intestinal media in the body, wherein the preconcentrate forms an emulsion comprising micelle particles. The emulsion may, for example, provide for increased or improved stability of the fatty acids for uptake in the body and/or provide increased or improved surface area for absorption. SNEDDS/SMEDDS/SEDDS may thus provide for enhanced or improved hydrolysis, solubility, bioavailability, absorption, or any combinations thereof of fatty acids in vivo. SNEDDS/SMEDDS/SEDDS presently disclosed may have the opposite relationship, i.e., the amount of fatty acid oil mixture comprising the active pharmaceutical ingredient (API) is greater than the amount of surfactant. The SNEDDS/SMEDDS/SEDDS presently disclosed may comprise a particle size (i.e., particle diameter) ranging from about 5 nm to about 10 μΐτι. For example, in some embodiments, the particle size ranges from about 5 nm to about 1 μηι, such as from about 50 nm to about 750 nm, from about 100 nm to about 500 nm, or from about 150 nm to about 350 nm. SNEDDS/SMEDDS/SEDDS presently disclosed may further comprise at least one non-active pharmaceutical ingredient, e.g., excipient. Non-active ingredients may solubilize, suspend, thicken, dilute, emulsify, stabilize, preserve, protect, color, flavor, and/or fashion active ingredients into an applicable and efficacious preparation, such that it may be safe, convenient, and/or otherwise acceptable for use. The at least one non-active ingredient may be chosen from colloidal silicon dioxide, crospovidone, lactose monohydrate, lecithin, microcrystalline cellulose, polyvinyl alcohol, povidone, sodium lauryl sulfate, sodium stearyl fumarate, talc, titanium dioxide, and xanthum gum. SNEDDS/SMEDDS/SEDDS presently disclosed may further comprise at least one antioxidant. Examples of antioxidants suitable for the present disclosure include, but are not limited to, a-tocopherol (vitamin E), calcium disodium EDTA, alpha tocoferyl acetates, butylhydroxytoluenes (BHT), and butylhydroxyanisoles (BHA). The compositions and/or preconcentrates presently disclosed may be administered, e.g., in capsule, tablet, sachet, or any other form suitable for drug delivery. The dosage form can be of any shape suitable for oral administration, such as spherical, oval, ellipsoidal, cube-shaped, regular, and/or irregular shaped. The dosage forms can be prepared according to processes known in the art and can include one or more additional pharmaceutically-acceptable excipients as discussed above. In some embodiments of the present disclosure, the compositions and/or preconcentrates are in a capsule or a tablet form. The capsule wall-forming material may comprise, for example, gelatin or polysaccharides other than alginate. In at least one embodiment, the capsule is a gelatin capsule. The capsules may be hard capsules or soft capsules. When the dosage form is in the form of tablets, the tablets may be, for example, disintegrating tablets, fast dissolving tablets, effervescent tablets, fast melt tablets, and/or mini-tablets. Tablet formulations are described, for example, in patent publication WO 2006/000229. In some embodiments of the present disclosure, the tablets comprise Neusilin (e.g., magnesium aluminometasilicate). The capsules and/or tablets of the present disclosure may comprise at least one coating. Such coatings can delay the release of the capsule or tablet (e.g., release of EPA and/or DHA) for a predetermined period. For example, the at least one coating may allow the dosage form to pass through the stomach without being subjected to stomach acid or digestive juices to provide for delayed release of EPA and/or DHA outside of the stomach. In some embodiments, the capsules and/or tablets release less than 30% of the total EPA and/or DHA in the stomach, such as less than 25%, less than 20%, less than 15%, or less than 10%. In some embodiments, the at least one coating is chosen from enteric coatings, sub-layers, top-layers, and combinations thereof. The term "sub-layer" as used herein means a coating layer located between the capsule wall material (e.g., gelatin wall) or the tablet surface and an enteric coating. The term "top-layer" as used herein means a coating layer over an enteric coating covering the capsule wall material or the tablet surface. The chemical composition of sub-layers and top-layers may vary depending upon the overall composition of the capsule or tablet. Typical materials for the sub-layers and top-layers presently disclosed include film-forming agents such as polysaccharides, for example hydroxypropyl methyl cellulose. [0151 ] In embodiments of the present disclosure, the capsules and/or tablets comprise at least ne enteric coating. In some embodiments, the capsules and/or tablets comprise at least one enteric coating and at least one top-layer over the at least one enteric coating. In other embodiments, the capsules and/or tablets comprise at least one enteric coating and at least one sub-layer between the capsule wall or the tablet surface and the at least one enteric coating. In still other embodiments, the capsules and/or tablets comprise at least one enteric coating, at least one sub-layer between the capsule wall or the tablet surface, and at least one top-layer over the at least one enteric coating. In some embodiments, at least one of the sub-layer(s) and/or top-layer(s) comprises hydroxypropyl methyl cellulose. ethylcellulose, and xanthan gum. Other agents can be added to improve the processability of the sealant or barrier layer. Such agents include talc, colloidal silica, polyvinyl alcohol, titanium dioxide, micronized silica, fumed silica, glycerol monostearate, magnesium trisilicate and magnesium stearate, or a mixture thereof. The sealant or barrier layer can be applied from solution (e.g., aqueous) or suspension using any known means, such as a fluidized bed coater (e.g., Wurster coating) or pan coating system. Suitable sealants or barriers include, for example, Opadry® products such as Opadry® II available from Colorcon. In some embodiments, the at least one coating is pH-independent. Coatings with pH-independent profiles generally erode or dissolve away after a predetermined period, and the period is generally directly proportional to the thickness of the coating. In other embodiments, the at least one coating is pH- dependent. Coatings with pH-dependent profiles can generally maintain their integrity while in the acid pH of the stomach, but erode or dissolve upon entering the more basic upper intestine. In some embodiments, the at least one coating is insoluble at a pH below about 5 and soluble at a pH above about 6.
methacrylate, and copolymers between metacrylic acid and ethyl acrylate) and polysaccharide and/or cellulose-based polymers and copolymers (e.g., cellulose acetate phthalate, hydroxypropyl methyl cellulose phthalate, and hydroxypropyl methyl cellulose acetate succinate). Others polymers include, for example, polyvinyl acetate phthalate. Additional materials suitable for the at least one coating include pharmaceutically acceptable acidic compounds that may not dissolve at the low pH in the stomach, but may dissolve at higher pH in the lower part of the gastrointestinal system. Commerically-available examples of polymers suitable for the present disclosure include EUDRAGIT® products from Evonik. EUDRAGIT® polymers are polymeric lacquer substances based on acrylates and/or methacrylates, and may be pH-independent or pH-dependent. For example, EUDRAGIT® RL and EUDRAGIT® RS are acrylic resins comprising copolymers of acrylic and methacrylic acid esters with a low content of quaternary ammonium groups. The ammonium groups are present as salts and give rise to permeability of the lacquer films. EUDRAGIT® RL and EUDRAGIT® RS are freely permeable (RL) and slightly permeable (RS), respectively, independent of pH. The polymers swell in water and digestive juices, in a pH-independent manner. In the swollen state, they are permeable to water and to dissolved active compounds. Specific examples include EUDRAGIT® RL 30D, EUDRAGIT® RL PO, EUDRAGIT® RL 100, EUDRAGIT® RL 12,5, EUDRAGIT® RS 30D, EUDRAGIT® RS PO, EUDRAGIT® RS 00, and EUDRAGIT® RS 12,5. Additional examples of pH- independent polymers include EUDRAGIT® E 100, EUDRAGIT® E 12,5, and EUDRAGIT® E PO. In at least one embodiment of the present disclosure, the at least one coating comprises EUDRAGIT® RS 30D. Further, for example, EUDRAGIT® L and EUDRAGIT® S are anionic polymers synthesized from methacrylic acid and methacrylic acid methyl ester. They are insoluble in acids and pure water, and become soluble in neutral to weakly alkaline conditions. The permeability of EUDRAGIT® L and EUDRAGIT S is pH dependent. Above pH 5.0, the polymers become increasingly permeable. Specific examples include EUDRAGIT® L100-55, EUDRAGIT® L30D-55, EUDRAGIT® L100, EUDRAGIT® L100 12,5, EUDRAGIT® S100, EUDRAGIT® S12,5, and EUDRAGIT® FS 30D. Additional examples of pH-dependent polymers include EUDRAGIT® E100, EUDRAGIT® E 12,5, and EUDRAGIT® PO. In at least one embodiment of the present disclosure, the at least one coating comprises EUDRAGIT® L100-55. The at least one coating may comprise at least one plasticizer. Plasticizers may, for example to improve the mechanical properties of pH-sensitive materials of the at least one coating. Suitable plasticizers include, but are not limited to, triethyl citrate, triacetin, polyethylene glycols, propylene glycol, phthalates, sorbitol and glycerin. The amount of plasticizer may vary depending upon the chemical composition of the at least one coating and the chemical composition and size of the capsule or tablet. In some embodiments, for example, the amount of plasticizer ranges from about 10% to about 60% by weight of the at least one coating. The amount of coating material or thickness of the at least one coating may vary depending upon the chemical compositions and number of different coating layers, and chemical composition, size, and shape of the capsule or the tablet. Generally speaking, the coating should be sufficient thick to prevent substantial release of EPA and/or DHA in the stomach, but also not contribute significantly to the capsule or tablet size. In some embodiments of the present disclosure, the thickness of the at least one coating ranges from about 10 microns to about 2 mm, such as from about 20 microns to about 1 mm. In some embodiments, the at least one coating comprises from about 1 % to about 50% of the dry capsule wall-forming material (e.g., gelatin). manufactured in low oxygen conditions to inhibit oxidation during the manufacturing process. The capsules may be prepared, for example, by direct encapsulation using standard methods known in the art. Examples of such methods include, but are not limited to, simple coacervation methods (see, e.g., ES 2009346, EP 0052510, and EP 0346879), complex coacervation methods (see, e.g., GB 1393805), double emulsion methods (see, e.g., U.S. 4,652,441 ), simple emulsion methods (see, e.g., U.S. 5,445,832), and solvent evaporation methods (see, e.g., GB 2209937). Those methods may, for example, provide for continuous processing and flexibility of batch size. The present disclosure further provides for coating pre-prepared capsules (e.g., gelatin capsules comprising a fatty acid oil mixture). The coating of pre-prepared capsules may be performed, for example, by spraying such as using spray drying techniques or spraying into a coating pan comprising preformed capsules, or by dipping capsules into coating solutions. In some embodiments of the present disclosure, the capsule fill content ranges from about 0.400 g to about 1.600 g. For example, in some embodiments, the capsule fill content ranges from about 0.400 g to about 1.300 g, from about 0.600 g to about 1.200 g, from about 0.600 g to about 0.800 g, from about 0.800 g to about 1 .000, from about 1.000 g to about 1.200 g, or any amount in between. For example, in some embodiments the capsule fill content is about 0.600 g, about 0.800 g, about 1.000 g, or about 1.200 g.
 In some embodiments of the present disclosure, the compositions and/or preconcentrates comprise from about 300 mg to about 400 mg of DHA, such as about 375 mg. In some embodiment, the compositions and/or preconcentrates comprise from about 400 mg to about 500 mg of EPA, such as about 465 mg. In one embodiment, for example, the compositions and/or preconcentrates comprise about 375 mg of DHA and about 465 mg of EPA. hypercholesterolemia, heart failure, and post-myocardial infarction. In one embodiment, the present disclosure provides for a method of treating at least one health problem in a subject in need thereof, comprising administering to the subject a pharmaceutical composition in a gelatin capsule or a tablet form comprising a pharmaceutically-effective amount of a fatty acid oil mixture comprising at least 75% eicosapentaenoic acid (EPA) and docosahexaenoic acid (DHA), by weight of the fatty acid oil mixture, wherein the EPA and DHA are in a form chosen from ethyl ester and triglyceride; and at least one free fatty acid; wherein the gelatin or the tablet comprises at least one coating. In some embodiments, the method treats at least one of elevated triglyceride levels, non-HDL cholesterol levels, LDL cholesterol levels and/or VLDL cholesterol levels. For example, the method may reduce triglyceride levels from about 30% to about 80%, such as from about 40% to about 70%, from about 40% to about 60%, or from about 30% to about 50%, in a subject with elevated triglyceride levels. In another embodiment, the present disclosure provides for a method of regulating at least one health problem in a subject in need thereof, comprising administering to the subject administering to the subject a supplement composition in a gelatin capsule or a tablet form comprising: a fatty acid oil mixture comprising from about 25% to about 75% eicosapentaenoic acid (EPA) and docosahexaenoic acid (DHA), by weight of the fatty acid oil mixture, wherein the EPA and DHA are in a form chosen from ethyl ester and triglyceride; and at least one free fatty acid; wherein the gelatin capsule or the tablet comprises at least one coating, and wherein the at least one health problem is chosen from irregular plasma lipid levels, cardiovascular functions, immune functions, visual functions, insulin action, neuronal development, heart failure, and post myocardial infarction. The present disclosure further provides for a method for enhancing at least one parameter chosen from hydrolysis, solubility, bioavailability, absorption, and combinations thereof of EPA and/or DHA. The bioavailablity may be increased, for example, by at least 40%, such as by about 80% or by at least 85%. In one embodiment, the method for enhancing at least one parameter chosen from hydrolysis, solubility, bioavailability, absorption, and combinations thereof of EPA and/or DHA comprises: combining a fatty acid oil mixture comprising EPA and DHA in a form chosen from ethyl ester and triglyceride; and at least one free fatty acid in a gelatin capsule or a tablet form, wherein the gelatin capsule or the tablet comprises at least one coating. In another embodiment, the method for enhancing at least one parameter chosen from hydrolysis, solubility, bioavailability, absorption, and combinations thereof of EPA and/or DHA comprises: combining a fatty acid oil mixture comprising EPA and DHA in a form chosen from ethyl ester and triglyceride; at least one free fatty acid; and at least one surfactant in a gelatin capsule or a tablet form, wherein the gelatin capsule or the tablet comprises at least one coating. In another embodiment, the method for enhancing at least one parameter chosen from hydrolysis, solubility, bioavailability, absorption, and combinations thereof of EPA and/or DHA comprises: combining a fatty acid oil mixture comprising EPA and DHA in free acid form and at least one free fatty acid in a gelatin capsule or a tablet form, wherein the gelatin capsule or the tablet comprises at least one coating. In yet another embodiment, the method for enhancing at least one parameter chosen from hydrolysis, solubility, bioavailability, absorption, and combinations thereof of EPA and/or DHA comprises: combining a fatty acid oil mixture comprising EPA and DHA in a form chosen from ethyl ester and triglyceride and at least one surfactant in a gelatin capsule or a tablet form, wherein the gelatin capsule or the tablet comprises at least one coating. The preconcentrates presently disclosed can form a self- nanoemulsifying drug delivery system (SNEDDS), self-microemulsifying drug delivery system (SMEDDS), or self-emulsifying drug delivery system (SEDDS) in an aqueous solution in the methods presently disclosed. In some embodiments of the present disclosure, the pharmaceutical or supplement compositions, or pharmaceutical or supplement preconcentrates may be administered to a subject in need thereof to treat and/or regulate at least one health problem. In some embodiments, the preconcentrates of the present disclosure form a self-nanoemulsifying drug delivery system (SNEDDS), a self-microemulsifying drug delivery system (SMEDDS), or a self-emulsifying drug delivery system (SEDDS) in an aqueous solution. In some embodiments, the aqueous solution is gastric media and/or intestinal media. The total daily dosage of the fatty acid oil mixture may range from about 0.600 g to about 6.000 g. For example, in some embodiments, the total dosage of the fatty acid oil mixture ranges from about 0.800 g to about 4.000 g, from about 1.000 g to about 4.000 g, from about 0.5000 g to about 4.000 g, from about 0.250 g to about 2.000 g, from about 0.400 g to about 2.000 g, or from about 1.000 g to about 2.000 g. In one embodiment, the fatty acid oil mixture is chosen from K85EE and AGP 103 fatty acid oil compositions. In another embodiment, the fatty acid oil mixture comprises K85FA. The administration may be oral or any other form of administration that provides a dosage of fatty acids, e.g., omega-3 fatty acids, to a subject, such as a human. For example, the compositions and preconcentrates presently disclosed may be administered as capsules and/or tablets in from 1 to 10 dosages, such as from 1 to 4 times a day, such as once, twice, three times, or four times per day, and further for example, once, twice or three times per day. In some embodiments of the present disclosure, the preconcentrate is a pharmaceutical preconcentrate in a gelatin capsule or a tablet form comprising a fatty acid oil mixture comprising at least 75% eicosapentaenoic acid (EPA) and docosahexaenoic acid (DHA), by weight of the fatty acid oil mixture, wherein the EPA and DHA are in a form chosen from ethyl ester and triglyceride; at least one free fatty acid; and at least one surfactant, wherein the gelatin capsule or the tablet comprises at least one coating. polysorbate 20, polysorbate 80, and mixtures thereof, wherein the gelatin capsule or the tablet comprises at least one coating. In another embodiment, the pharmaceutical preconcentrate in a gelatin capsule or a tablet form comprises: a fatty acid oil mixture comprising from about 80% to about 88% EPA and DHA by weight of the fatty acid oil mixture, wherein the EPA and DHA are in ethyl ester form; at least one free fatty acid comprising oleic acid; and at least one surfactant chosen from polysorbate 20, polysorbate 80, and mixtures thereof; wherein the at least one surfactant comprises less than 40%, by weight relative to the weight of the preconcentrate, and wherein the gelatin capsule or the tablet comprises at least one coating. In another embodiment, the pharmaceutical preconcentrate in a gelatin capsule or a tablet form comprises: a fatty acid oil mixture comprising from about 80% to about 88% EPA and DHA by weight of the fatty acid oil mixture, wherein the EPA and DHA are in ethyl ester form; at least one free fatty acid comprising linoleic acid; and at least one surfactant chosen from polysorbate 20, polysorbate 80, and mixtures thereof; wherein the at least one surfactant comprises less than 35%, by weight relative the weight of the preconcentrate, and wherein the gelatin capsule or the tablet comprises at least one coating. In another embodiment, the pharmaceutical preconcentrate in a gelatin capsule or a tablet form comprises: a fatty acid oil mixture comprising from about 80% to about 88% EPA and DHA by weight of the fatty acid oil mixture, wherein the EPA and DHA are in ethyl ester form; at least one free fatty acid comprising from about 80% to about 88% EPA and DHA, by weight of the at least one free fatty acid, wherein the EPA and DHA are in free acid form; and at least one surfactant chosen from polysorbate 20, polysorbate 80, and mixtures thereof, wherein the gelatin capsule or the tablet comprises at least one coating. For example, the pharmaceutical preconcentrate may comprise K85EE as the fatty acid oil mixture, K85FA as the at least one free fatty acid, and at least one surfactant chosen from polysorbate 20, polysorbate 80, and mixtures thereof. [0181 ] In another embodiment, the pharmaceutical preconcentrate may comprise K85EE as the fatty acid oil mixture, K85FA as the at least one free fatty acid, and at least one surfactant chosen from polysorbate 20 or polysorbate 80, wherein the [K85EE]:[Tween]:[K85FA] ranges from e.g. about 5:2:0.5 to 5:4:2. In a further embodiment, the ration between [K85EE]:[Tween]:[K85FA] is about [4-5] : [3- 4]:[1-1.5]. In another embodiment, minimum of about 5-10% up to maximum of about 50% of fatty acid oil mixture comprising from about 80% to about 88% EPA and DHA by weight of the fatty acid oil mixture, wherein the EPA and DHA are in ethyl ester form, is substituted by a free fatty acid chosen from a K85-FA composition (corresponding to a K85-FA fatty acid profile achieved by hydrolyzing a K85-EE fatty acid ethyl ester composition) EPA, DPA, DHA, and combinations thereof. For example, the EPA-EE and DHA-EE content from 400 mg/g to 840 mg/g of total fatty acid oil mixture is replaced by 40 to 440 mg/g Free fatty acid chosen from a K85-FA composition. In other embodiments, the preconcentrate in a gelatin capsule or a tablet form is a food supplement or nutritional supplement preconcentrate comprising a fatty acid oil mixture comprising from about 25% to about 75% eicosapentaenoic acid (EPA) and docosahexaenoic acid (DHA), by weight of the fatty acid oil mixture, wherein the EPA and DHA are in a form chosen from ethyl ester and triglyceride; at least one free fatty acid; and at least one surfactant, wherein the gelatin capsule or the tablet comprises at least one coating. In some embodiments of the present disclosure, the preconcentrate is a pharmaceutical preconcentrate in a gelatin capsule or a tablet form comprising a fatty acid oil mixture comprising at least 75% eicosapentaenoic acid (EPA) and docosahexaenoic acid (DHA), by weight of the fatty acid oil mixture, wherein the EPA and DHA are in free fatty acid form; and at least one surfactant, wherein the gelatin capsule or the tablet comprises at least one coating. In one embodiment, for example, the pharmaceutical preconcentrate in a gelatin capsule or a tablet form comprises: a fatty acid oil mixture comprising from about 80% to about 88% EPA and DHA by weight of the fatty acid oil mixture, wherein the EPA and DHA are in free acid form; and at least one surfactant chosen from polysorbate 20, polysorbate 80, and mixtures thereof, wherein the gelatin capsule or the tablet comprises at least one coating. In one embodiment, the pharmaceutical preconcentrate in a gelatin capsule or a tablet form comprises: a fatty acid oil mixture comprising from about 80% to about 88% EPA and DHA by weight of the fatty acid oil mixture, wherein the EPA and DHA are in free acid form; and at least one surfactant chosen from polysorbate 20, polysorbate 80, and mixtures thereof; wherein the at least one surfactant comprises less than 40%, by weight relative to the weight of the preconcentrate, and wherein the gelatin capsule or the tablet comprises at least one coating. wherein the at least one surfactant comprises less than 35%, by weight relative the weight of the preconcentrate, and , wherein the gelatin capsule or the tablet comprises at least one coating. In another embodiment, the pharmaceutical pre-concentrate in a gelatin capsule or a tablet form comprises a K85FA fatty acid oil mixture and at least one surfactant chosen from polysorbate 20 and polysorbate 80, wherein the gelatin capsule or the tablet comprises at least one coating. In other embodiments, the preconcentrate is a food supplement preconcentrate or nutritional supplement preconcentrate in a gelatin capsule or a tablet form comprising a fatty acid oil mixture comprising from about 25% to about 75% eicosapentaenoic acid (EPA) and docosahexaenoic acid (DHA), by weight of the fatty acid oil mixture, wherein the EPA and DHA are in free acid form; and at least one surfactant, wherein the gelatin capsule or the tablet comprises at least one coating. In some embodiments of the present disclosure, the preconcentrate is a pharmaceutical preconcentrate in a gelatin capsule or a tablet form comprising a fatty acid oil mixture comprising at least 75% eicosapentaenoic acid (EPA) and docosahexaenoic acid (DHA), by weight of the fatty acid oil mixture, wherein the EPA and DHA are in a form chosen from ethyl ester and triglyceride; and at least one surfactant, wherein the gelatin capsule or the tablet comprises at least one coating. In one embodiment, the pharmaceutical preconcentrate in a gelatin capsule or a tablet form comprises: a fatty acid oil mixture comprising at least 95% of EPA ethyl ester, DHA ethyl ester, or mixtures thereof, by weight of the fatty acid oil mixture; and a least one surfactant chosen from polysorbate 20, polysorbate 80, and mixtures thereof, wherein the gelatin capsule or the tablet comprises at least one coating. In another embodiment, the pharmaceutical preconcentrate in a gelatin capsule or a tablet form comprises: a fatty acid oil mixture comprising from about 80% to about 88% EPA and DHA by weight of the fatty acid oil mixture, wherein the EPA and DHA are in ethyl ester form; and at least one surfactant chosen from polysorbate 20, polysorbate 80, and mixtures thereof; wherein the at least one surfactant comprises less than 40%, by weight relative to the weight of the preconcentrate, wherein the gelatin capsule or the tablet comprises at least one coating. preconcentrate, wherein the gelatin capsule or the tablet comprises at least one coating. preconcentrate in a gelatin capsule or a tablet form comprises K85EE as the fatty acid oil mixture, and at least one surfactant chosen from polysorbate 20, polysorbate 80, and mixtures thereof, wherein the gelatin capsule or the tablet comprises at least one coating. In another embodiment, the pharmaceutical preconcentrate in a gelatin capsule or a tablet form comprises a fatty acid oil mixture comprising from about 80% to about 88% EPA and DHA, by weight of the fatty acid oil mixture, wherein the EPA and DHA are in ethyl ester form; at least one surfactant chosen from polysorbate 80; and at least one co-surfactant comprising ethanol, and wherein the gelatin capsule or the tablet comprises at least one coating. In other embodiments, the preconcentrate is a food supplement preconcentrate or nutritional supplement preconcentrate in a gelatin capsule or a tablet form comprising a fatty acid oil mixture comprising from about 25% to about 75% EPA and DHA, by weight of the fatty acid oil mixture, wherein the EPA and DHA are in a form chosen from ethyl ester and triglyceride; and at least one surfactant, and , wherein the gelatin capsule or the tablet comprises at least one coating. The following examples are intended to illustrate the present disclosure without, however, being limiting in nature. It is understood that the skilled artisan will envision additional embodiments consistent with the disclosure provided herein. Different preconcentrates were prepared as described in Table 9. To prepare the preconcentrates, the components were mixed according to the schemes identified below on a weight to weight basis. The preconcentrates were visually inspected after mixing and again after being stored for 24 hours at room temperature. Under the Preconcentrate heading, a "clear" designation represents a transparent homogenous mixture; an "unclear" designation represents a nonhomogenous mixture, where some turbidity can be observed by visual inspection. The degree of turbidity was not determined. composition of the gastric media is shown in Table 8. 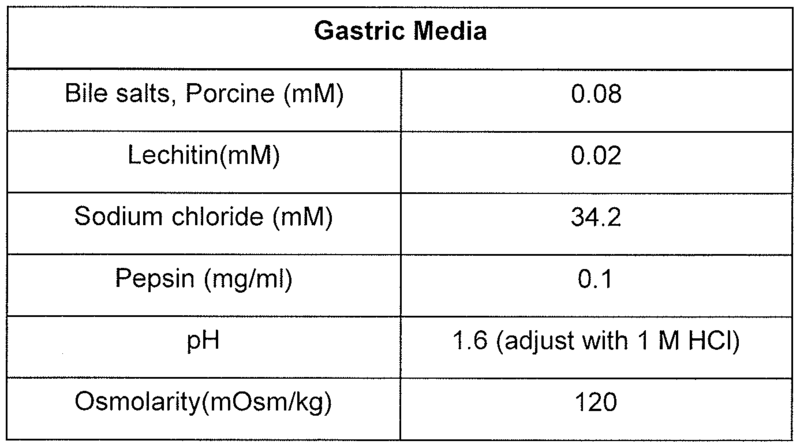 Table 8: Composition of Gastric Media. The outcome of the emulsification was recorded approximately 3 hours after mixing. A majority of the preconcentrates formed milky emulsions immediately after mixing. Emulsions that stayed milky and homogenous after 3 hours are described as "milky," under the Emulsion heading. Emulsions that separated or became nonhomogenous or where oil drops were observed are described as "separates," under the Emulsion heading. Selected emulsions were further characterized by determining the particle size. Particle size was measured using a Malvern Zetasizer (Malvern Instrument, Worcestershire, UK) with particle size measuring range of 0.5 - 6000 nm and Zeta potential of particle range of 3 nm - 10 pm. The particle size was measured in triplicate. The K85EE (EE = ethyl ester) fatty acid composition used herein is sold in a gelatin capsule and branded primarily under the trademarks Lovaza™ or Omacor®. Tween- Ricinoleic Pre- EE Vol. Ratio Emulsion Size 20 (mg) Acid (mg) conc. Pre- EE 40 acid Vol. Ratio Emulsion Size conc. Pre- EE 60 Acid Vol. Ratio Emulsion Size conc. Pre- EE 80 Acid Vol. Ratio Emulsion Size conc. Soritol Pre- EE Acid Vol. Ratio Emulsion Size (mg) conc. Pre- EE 400 Acid Vol. Ratio Emulsion Size conc. Tween- Pre- EE Acid Vol. Ratio Emulsion Size 20 (mg) conc. No Pre- EE 60 Acid Vol. Ratio Emulsion Size conc. No Pre- EE 80 Acid Vol. Ratio Emulsion Size conc. K85- Tween- Erucuc Total Particle o Pre- EE 20 Acid Vol. Ratio Emulsion Size conc. No Pre- EE 40 Acid Vol. Ratio Emulsion Size conc. No Linolenic Pre- EE 20 Vol. Ratio Emulsion Size acid conc. Of the preconcentrates prepared, formulation number 85 facilitated a load of 60% K85EE into the preconcentrate and gave a stable emulsion in gastric media with a particle size determined to be about 275 nm. Attempts to prepare preconcentrates with saturated fatty acids, stearic acid and decanoic acid failed. Although homogenous preconcentrates could be obtained by heating, a precipitation of stearic acid or decanoic acid was observed upon cooling of the preconcentrate to room temperature. nonhomogenous mixture, where some turbidity can be observed by visual inspection. The degree of turbidity was not determined. Preconcentrate heading, a "clear" designation represents a transparent homogenous mixture; a "turbid" designation represents a non-homogenous mixture, where some turbidity can be observed by visual inspection. The degree of turbidity was not determined. Table 1 1 : Compatibility of Solvent and Preconcentrates. Preconcentrates A- L described in Table 12 were prepared as provided in Example 1.
preconcentrates can be mixed in any proportion and these mixtures will still form homogenous and clear preconcentrates. Preconcentrates A-L were also screened for compatibility with various solvents. The outcome of this screening is shown in Table 13 below. To 500 mg of preconcentrate, approximately 50 mg of each solvent was added. Preconcentrate A was used for all the solvents. Ethanol was tested in all the preconcentrates. The preconcentrates were visually inspected after mixing and again after being stored for 24 hours at room temperature. Under the Preconcentrate heading, a "clear" designation represents a transparent homogenous mixture; an "unclear" designation represents a nonhomogenous mixture, where some turbidity can be observed by visual inspection. The degree of turbidity was not determined. Viscosity can be used as a physical characterization parameter. Viscosity measurements were taken for preconcentrates A-L in triplicate. Generally, the viscosity showed greater sensitivity for the type of fatty acid than for the type of surfactant. FIG 1 graphically illustrates the viscosity of preconcentrates A-L. Although the viscosity measurements cannot distinguish between Tween 20 versus Tween 80, the viscosity can be impacted by the free fatty acid. Preconcentrates A-F, I and J were diluted in gastric and intestinal media to form an emulsion (i.e., SNEDDS/SMEDDS/SEDDS). The composition of the gastric media is shown in Table 14, and the composition of the intestinal media is shown in Table 15. Particle size was measured using a Malvern Zetasizer (Malvern Instrument, Worcestershire, UK) with particle size measuring range of 0.5 - 6000 nm and Zeta potential of particle range of 3 nm - 10 pm. The particle size was measured in triplicate. For the gastric media, the emulsions were prepared by adding 1 ml of gastric media to 50 mg of the preconcentrate. Table 16 below provides the particle size measurements for preconcentrates A-F, I and J in the gastric media. The particle size measurements in gastric media are also graphically illustrated in FIG 2. Table 16: Particle size measurements for preconcentrates A-F, I and J in gastric media. For the intestinal media, the emulsions were prepared by adding the gastric media (100 μΙ) obtained above to intestinal media (900 μΙ). Table 17 below provides the particle size measurements for preconcentrates A-F, I and J in the intestinal media. The particle size measurements in intestinal media are also graphically illustrated in FIG 2. Table 17: Particle size measurements for preconcentrates A-F, I and J in intestinal media. As shown in FIG 2, intestinal media has a larger impact on the particle size distribution and particularly, preconcentrates comprising Tween 80. That observation has been visualized in FIGs 3-18. FIGs 3-18 show the read out from the Malvern zetasizer for four consecutive measurements on the same sample of each respective preconcentrate. All the preconcentrates give near to unimodal particle size distributions in gastric media, whereas only preconcentrates comprising Tween 20 stays unimodal when transferred to intestinal media. Studies were done to analyze the rate of lipolysis (i.e., hydrolysis) and solubilization for different preconcentrates comprising K85EE and different free fatty acids and surfactants. Specifically, four experiments were designed to determine how the amount of surfactant influences the rate and extent of lipolysis and solubilization. The lipolysis was conducted on SMEDDS formulations comprising K85EE. conjugates of hyodeoxycholic acid and other bile salts. ■ Pancreatic lipase, Porcine pancreas (Sigma); contains many enzymes, including amylase, trypsin, lipase, ribonuclease and protease. Preconcentrates A-E were prepared as summarized in Table 18. The in vitro dynamic lipolysis model developed by Zangenberg et al. (Zangenberg, N.H. et al., Eur. J. Pharm. Sci. 14, 237-244, 2001 ; Zangenberg, N.H., et al., Eur. J. Pharm. Sci. 14, 1 15-122, 2001) was used with slight modifications. The lipolysis was conducted in a thermostated 600 ml jacketed glass vessel in the presence of porcine bile extract, with continuous addition calcium chloride. The lipase source was porcine pancreatin and the hydrolysis was followed by titration with sodium hydroxide solution (1.0 N) using a pH stat (pH 6.5). 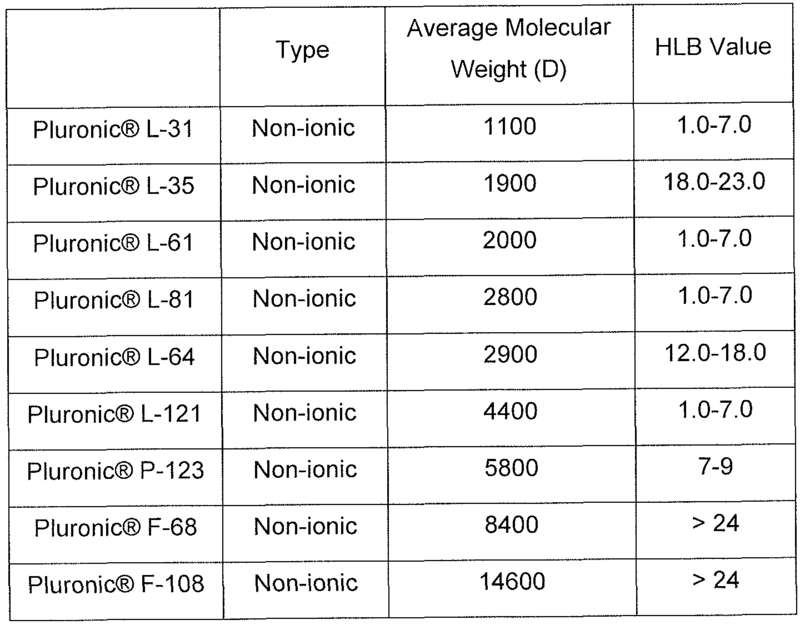 The initial composition of the lipolysis media is shown in Table 19. Table 19: Initial composition of lipolysis media. The final volume in all experiments was 300 ml and the calcium dispensing rate during the experiments was 0.045 mmol/min (0.09 ml/min). In all experiments, the amount of K85-EE added corresponds to 5.58 mg/ml. To determine the course of K85-EE lipolysis by HPLC, crude samples were withdrawn and acidified with dilute hydrochloric acid. The concentrations of EPA-EE, DHA-EE, EPA-FA and DHA-FA were determined by HPLC in triplicate. Experiments were performed with LC Agilent Technologies 1200 series at a column temperature of 30°C, mobile phase (A) water (0.1 % acetic acid) and (B) MeCN (0.1 % acetic acid), with gradient: 0 to 8 minutes, from 70% B to 100% B; 8 to 15 minutes, 100 % B; 16 to 16 minutes: from 100 % B to 70% B, 16 to 20 minutes: 70% B. The flow rate was 0.5 ml/min, UV @ 210 nM, injection volume: 5 μΙ, and run time: 20 minutes. Concentrations of EPA ethyl ester (EPA-EE), DHA ethyl ester (DHA- EE), EPA free acid (EPA-FA), and DHA free acid (DHA-FA) were monitored over time and the rate of lipolysis calculated as shown in Table 20 for comparison with Omacor®. disappearance of EPA-EE and DHA-EE and the appearance of EPA-FA and DHA-FA during lipolysis of each respective sample examined. Sample points from 2 minutes to 233 minutes were included in the graphs. In addition, linear regression lines have been included. FIGs 20, 23, 26, 29, 32, and 35 provide the percent recovery of EPA + DHA at different time-points for each respective sample examined. Data are given as the sum of EPA-EE, DHA-EE, EPA-FA, and DHA-FA and given as a percentage of theoretical amount 5580 pg/ml. FIGs 21 , 24, 27, 30, 33, and 36 graphically illustrate the percent lipolysis at different time points for EPA-EE, DHA-EE and total K85EE. Values are calculated relative to the total amount of EPA-EE and DHA-EE determined by HPLC after lipolysis for 2 minutes. preconcentrates, wherein the fatty acid oil mixture is a K85-EE composition are presented in Table 21. A tablet formulation is prepared with the components identified in Table 23 by immersing a tablet in a K85EE or AGP oil and an oil in free acid form. The preconcentrate can be prepared by mixing a fatty acid oil mixture together with at least one surfactant and a free fatty acid. The preconcentrate can be visually inspected after mixing and again after being stored at 24 hours at room temperature and clear and transparent preconcentrate can be obtained. To the preconcentrate can then an aqueous medium be added to form an oil-in-water emulsion. The dispersion rate for the formation of the oil-in-water emulsion can be very fast, less than one minute. [0241 ] The microemulsions formed can then be tested regarding hydrolysis, also called lipolysis. HPLC, crude samples can be withdrawn and acidified with dilute hydrochloric acid. The concentrations of EPA- ethyl ester, DHA ethyl ester, EPA-free fatty acid and DHA-free fatty acid can then determined by HPLC. All samples withdrawn from a non-homogenous phase and some variability in recovery can be expected, especially at early time points. 24: Initial concentrations of components in the hydrolysis medium. The oil-in-water emulsions can then be further analyzed to determine the particle size of the oil droplets. The particle size can be determined with Malvern Zetasizer (Malvern Instrument, Worcestershire, UK) having particle size measuring range of 0.6 - 6000 nm and Zeta of particle range of 3nm - 10μιη. pharmaceutical compositions and food supplement compositions according to the present disclosure. Table 25: Sample compositions according to the present disclosure. 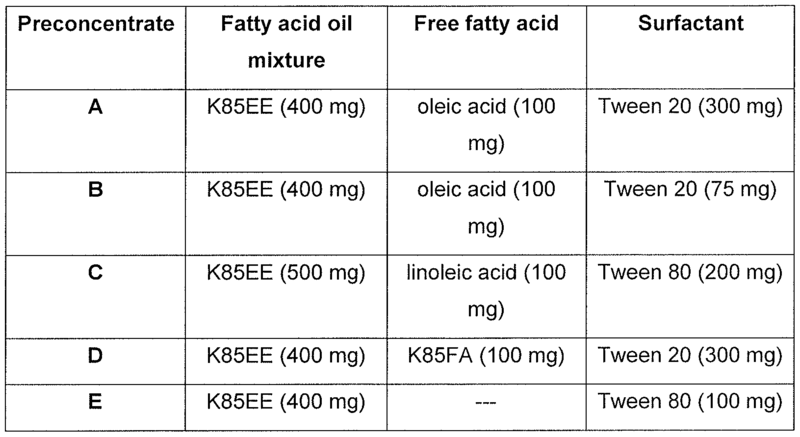 Further for example, K85EE omega-3 fatty acid oil and the free fatty acid chosen from K85FA having a EPA:DHA -FA ratio more or less equal to the EPA:DHA -EE ratio in K85EE are exemplified in Table 26. Table 26: Additional compositions according to the present disclosure. Additionally, the total oil mixtures presented above can be mixed with the surfactant Tween®20. Further for example, the K85EE mixed fatty acid composition comprises at least 90% omega-3 ethyl ester fatty acids, and wherein the mixed fatty acid composition comprises from about 80% to about 88% eicosapentaenoic acid ethyl ester and docosahexaenoic acid ethyl ester, by weight of the fatty acid composition. A collection of ratios between [oil]:[surfactant]:[free fatty acid] (a):b):c)) are illustrated in Table 27. For example, a K85EE or AGP103 oil is used together with a surfactant and a co-surfactant in the [K85EE]:[surfactant]:[free fatty acid] ranges from about 4:2:0.5 to 4:4:2. Thus, the range for the surfactant may be from 2 to 4 and the free fatty acid from 0.5 to 2. It is also included herein that the K85EE oil mixture presented in Table 27 above can be replaced by a K85TG oil mixture as well as a commercial omega-3 oil concentrate in ethyl ester and/or triglyceride form. DHA-FA in an amount of 1 .24 g.
 With mixing, a transparent homogenous solution was obtained. The density of the formulation was determined to be 1 .02 g/ml. The composition was then filled in vials (vial seize = 4ml) each comprising 1 .25 x 1670 mg = 2087 mg were prepared, flushed with nitrogen and sealed with parafilm. 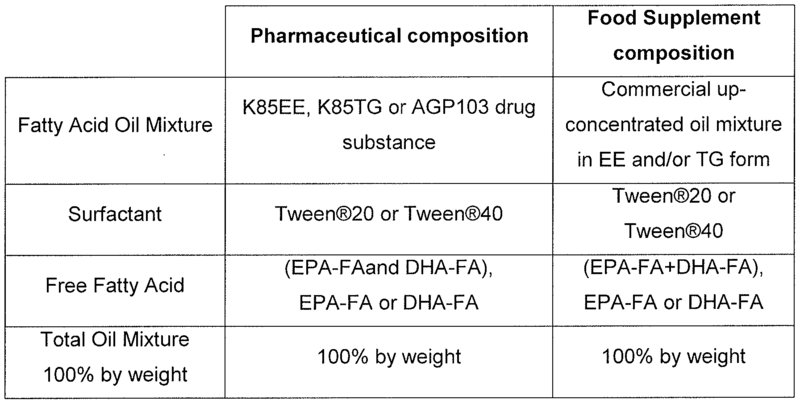 components: K85EE, Tween20 EPA-FA and DHA-FA in the specified amounts, and Formulation 2 was OMACOR gelatine capsules. Ellegaard Gottingen Minipigs ApS. The animals were housed individually in floor pens (1.2 m2) with sawdust ("Jeluxyl" from Jelu Werk GmbH, Josef Ehrler GmbH & Co KG, Ludwigsmuhle, D-73494 Rosenberg, Germany) as bedding. performed with a wash out period of at least 10 days between each dosing. Blood samples (n=8) were taken post-dosing. Plasma samples were analysed within 2 weeks for total lipid content of EPA and DHA by a validated LC-MS/MS method. The result presented in FIG 37 shows the plasma concentration versus time profile of the total lipid concentration of EPA, supporting supra- bioavailability (e.g., great than 40%) for the K85 SMEDDS formulation. A similar results has also been shown for the time profile of total lipid concentration of DHA (not shown in FIG 37). Table 28 illustrates pharmaceutical formulations, SMEDDs, and SEDDs that can be prepared. In an embodiment, the surfactant is chosen from among Tween® surfactants, such as 20, 40, 60, 80, and 85. For example, a composition according to the disclosure can include at least one surfactant chosen from Tween® 20 and 40. The following emulsion/microemulsions preconcentrate formulations according to the disclosure were prepared. A pharmaceutical composition was prepared by mixing the following components: Fatty acid oil mixture a) EPA-FA in an amount of 5.5 g and DHA-FA in an amount of 4.5 g (achieving approximately the EPA: DHA ratio in a K85EE or FA fatty acid mixture); b) a second fatty acid mixture in EE form: ethyl oleate: Fluka 75100, 137044 50308P14 in an amount of 5.0 g; and as the surfactant c): Tween® 20, Molecular Biology Grade, AppliChem Darmstadt, A4974.0250 lot 5N004174 in an amount of 10.0 g.
 A transparent homogenous solution was obtained. The density of the formulation was determined to be 1.03 g/ml. The composition was then filled into vials (vial size = 4 ml) each comprising (2450 mg X 1.25) = 3063 mg were prepared, flushed with nitrogen and sealed with parafilm. The same formulation as illustrated above was made with Tween® 80, instead of Tween® 20. Thus, mixed fatty acids; EPA-FA (1 10mg) + DHA-FA (90 mg), ethyl oleate (100mg) and Tween 80 (200mg). A transparent homogenous solution was obtained. 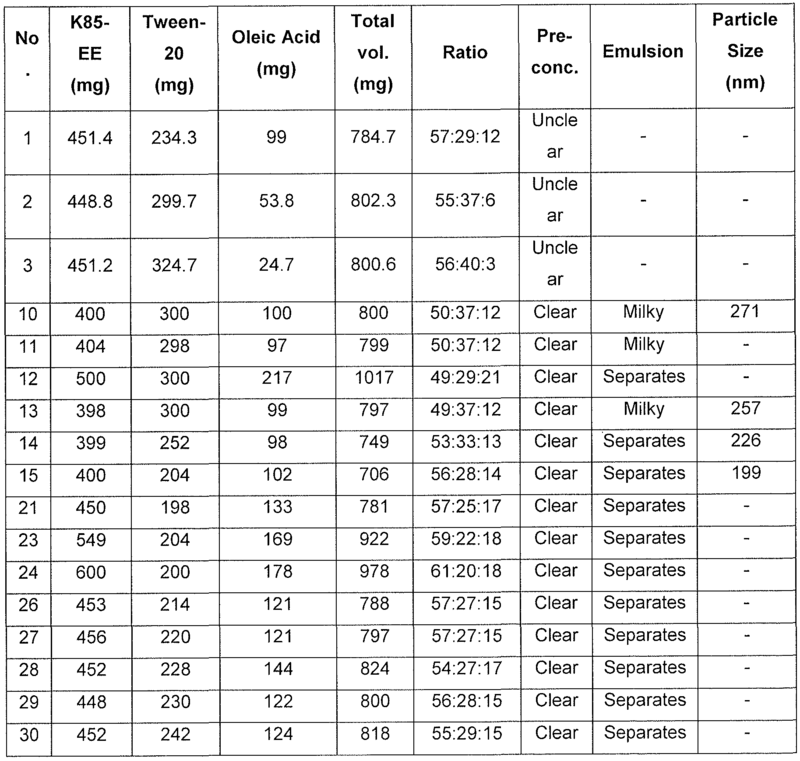 The oil content in one capsule Omacor®, comprising EPA ethyl ester (465 mg), DHA ethyl ester (375 mg) and alpha-tochopherol (4 mg) were mixed in a scintillation vial with various surfactants as shown in Table 29. Water (10 ml) was added at 37 degrees centigrade and the mixture was shaken for 15 seconds using a Vortex mixer. The mixture was observed after 1 minute and after 5 minutes. The visual score for emulsion homogeneity was scored as follows: No emulsion = score 0, emulsion but not homogeneous emulsion= score 1 , homogenous emulsion = score 2. The mixture was after mixing also rolled in a roller mixer for 5 minutes. The visual score for this roller test was the same. Table 29: Emulsions in pure water. 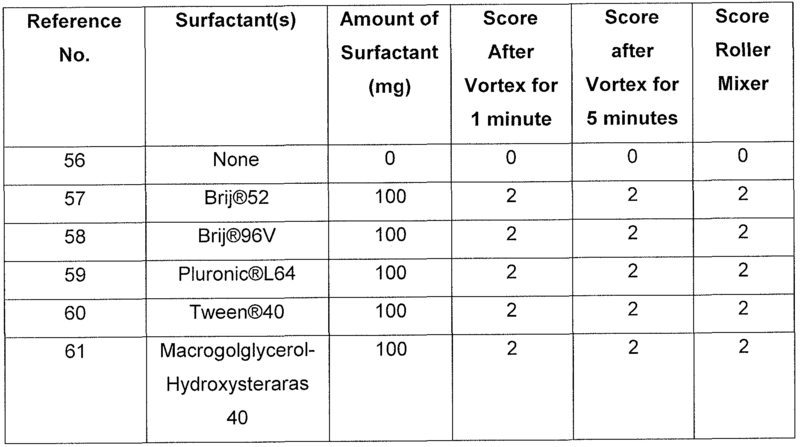 The oil content in one capsule OMACOR®, comprising EPA ethyl ester (465 mg), DHA ethyl ester (375 mg) and alpha-tochopherol (4 mg) were mixed in a scintillation vial with various surfactants as shown in Table 30. The experimental set up is the same as described in Example 14 except that that artificial gastric juice without pepsin (European Pharmacopeia 6.0, page 274) was used instead of water. 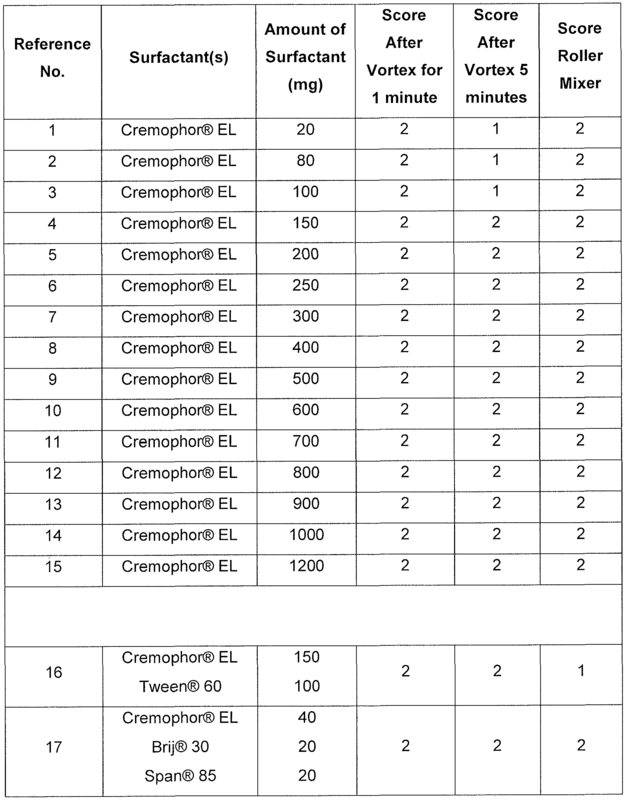 The oil content in one capsule Omacor®, comprising EPA ethyl ester (465 mg), DHA ethyl ester (375 mg) and alpha-tochopherol (4 mg) were mixed in a scintillation vial with various surfactants as shown in Table 31 . The experimental set up is the same as described in Example 14 except that simulated intestinal fluid pH 6.8 without pancreas powder (European Pharmacopeia 6.0, page 274) was used instead of water. Table 31 : Emulsions in simulated intestinal fluid. Emulsions from Reference No. 52 (gastric juice) of Example 15 and Reference No. 58 (intestinal fluid) of Example 16 were examined under the microscope after 24 hours rolling. Both emulsions were found to be suspensions of oil in water with no tendency to aggregation. [0291 ] Table 32 illustrates pharmaceutical formulations that can be prepared. In an embodiment, the surfactant or combination of surfactants is chosen from Tween® surfactants; Tween® 20, Tween® 40, Tween® 60, Tween® 65, Tween® 80 and Tween® 85. In another embodiment, the surfactant is chosen from a combination of a Tween® surfactants and a surfactant chosen from Cremphor®, for instance Tween® 20 and Cremphor EL. Moreover, in a further embodiment, a Tween® 20 and Solutol HS 15 surfactant can be used together as well as Tween® 20 and Tween® 40. Fatty acid oil mixtures of pharmaceutical preconcentrates, wherein the fatty acid oil mixture is a K85EE or AGP-103 oil composition are presented in Table 33. Table 33: Fatty acid oil mixture for pharmaceutical preconcentrates. 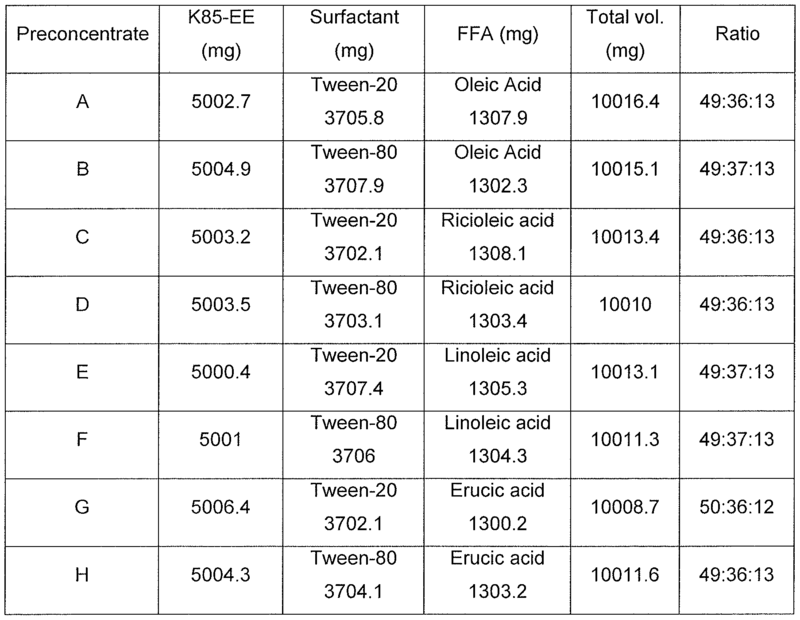 Preconcentrates 1 -23 were prepared with EPA/DHA ethyl ester (1000 mg K85EE) and various surfactants and surfactant mixtures as shown in Table 34. Emulsions were prepared in both gastric juice and simulated intestinal fluid as described in Examples 15 and 16. Results were the same for emulsions in artificial gastric juice and simulated intestinal fluid, and appear in Table 34. Table 34: Emulsions in artificial gastric juice and simulated intestinal fluid. Emulsions 4-15 prepared in both artificial gastric juice and simulated intestinal fluid were homogenous (milky) for several hours when standing . Emulsions 1 -3 separated somewhat after preparation (i.e., after several hours of standing). Microscopy of Emulsions 1-15 showed that the average particle size was less than 100 micrometers. Homogenization treatment (UltraRurrax(IKA)) of Emulsion 4 for 20 seconds resulted in a substantial increase of formation of small particles (< 10 microns). [0301 ] Preformed gelatin capsules comprising EPA ethyl ester and DHA ethyl ester (Omacor®, Pfizer, Norway) were coated by a solution of cellulose acetate phthalate (6%) and triethyl citrate (3%) in acetone. The capsules were dried for 24 hour at room temperature. The coating material (cellulose acetate phthalate plus triethyl citrate) on one capsule increased the capsule weight by 15 mg.
 Preformed gelatin capsules comprising EPA ethyl ester (463 mg), DHA ethyl ester (375 mg), Brij® 96V (60 mg) and tocoferol (4 mg) were coated by a solution of cellulose acetate phthalate (6%) and triethyl citrate (3%) in acetone. The capsules were dried for 24 hour at room temperature. Preformed gelatin capsules comprising EPA ethyl ester and DHA ethyl ester (Omacor®, Pfizer, Norway) were coated by an aqueous solution of Euragit® RS30D from Degussa, Germany. The capsules were dried for 24 hour at room temperature. Preformed gelatin capsules comprising EPA ethyl ester (463 mg), DHA ethyl ester (375 mg), Brij® 96V (60 mg) and tocoperol (4 mg) were coated by an aqueous solution of Euragit® RS30D from Degussa, Germany. The capsules were dried for 24 hour at room temperature. Coated tablets were prepared and administered to a animal model (mini-pig) to measure EPA and DHA blood serum levels over time. Pre-treatments were performed in a fluid-bed where the solutions were sprayed on Neusilin granules followed by heating and/or compressing the granules and incubation in Nitrogen over night before loading with K85EE oil. Tablets were coated with an inner layer of an aqueous PVA sub- coating (Opadry® II) and an outer layer of an aqueous enteric coating (Acyl EZE (Eudragit® L100-55 enteric coating). Results for EPA blood serum levels appear in Table 35 and illustrated in FIG 38. Results for DHA blood serum levels appear in Table 36 and illustrated in FIG 39.
rAUC data not baseline corrected. The tablets according to the present disclosure may be pre-loaded with a pre-concentrate chosen from a K85EE oil + FFA + at least one surfactant (e.g. Tween® 20 or Tween® 80), a K85FA oil + at least one surfactant, and K85EE + at least one surfactant. wherein the gelatin capsule or the tablet comprises at least one coating. 2. The composition according to claim 1 , wherein the at least one coating is chosen from enteric coatings, sub-layers, top-layers, and combinations thereof. 3. The composition according to claim 2, wherein the gelatin capsule comprises at least one enteric coating. 4. The composition according to claim 2, wherein the gelatin capsule comprises at least one enteric coating and at least one top-layer above the enteric coating. 5. The composition according to claim 2, wherein the gelatin capsule comprises at least one enteric coating and at least one sub-layer between the gelatin capsule wall and the enteric coating. 6. The composition according to claim 5, wherein the at least one sub-layer comprises a sealant. 7. The composition according to claim 5, wherein the gelatin capsule further comprises at least one top-layer above the enteric coating. 8. The composition according to claim 2, wherein the tablet comprises at least one enteric coating. 9. The composition according to claim 2, wherein the tablet comprises at least one enteric coating and at least one top-layer above the enteric coating. 10. The composition according to claim 2, wherein the tablet comprises at least one enteric coating and at least one sub-layer between the tablet surface and the enteric coating. 1 1 . The composition according to claim 10, wherein at least one sub-layer comprises a sealant. 12. The composition according to claim 10, wherein the tablet further comprises at least one top-layer above the enteric coating. 13. The composition according to claim 1 , wherein the at least one coating comprises at least one material chosen from gelatin, film-forming agents, polymers, and copolymers. methacrylic acid and methyl methacrylate, copolymers between methacrylic acid and methyl acrylate, copolymers between metacrylic acid and ethyl methacrylate, copolymers between metacrylic acid and ethyl acrylate, cellulose acetate phthalate, hydroxypropyl methyl cellulose phthalate, hydroxypropyl methyl cellulose acetate succinate, polyvinyl acetate phthalate, and mixtures thereof. 15. The composition according to claim 1 , wherein the at least one coating is pH-dependent or pH-independent. 16. The composition according to claim 1 , wherein the at least one coating comprises at least one plasticizer. 17. The composition according to claim 16, wherein the at least one plasticizer is chosen from triethyl citrate, triacetin, polyethylene glycol, propylene glycol, phthalates, sorbitol, glycerin, and mixtures thereof. 18. The composition according to claim 1 , wherein the gelatin capsule is a hard capsule or a soft capsule. 19. The composition according to claim 1 , wherein the gelatin capsule fill content ranges from about 0.400 g to about 1.300 g.
20. The composition according to claim 1 , wherein the gelatin capsule fill content ranges from about 0.600 g to about 1.200 g.
21. The composition according to claim 1 , wherein the gelatin capsule fill content ranges from about 0.800 g to about 1.000 g.
22. The composition according to claim 1 , wherein the gelatin capsule or tablet releases less than 30% of the total EPA and DHA in the stomach. from about 40% to about 50% by weight, relative to the weight of the preconcentrate, of at least two surfactants chosen from polysorbate 20 and lecithin; wherein the gelatin capsule or the tablet comprises at least one coating. from about 30% to about 40% by weight, relative to the weight of the preconcentrate, of at least two surfactants chosen from polysorbate 20 and lecithin; wherein the gelatin capsule or the tablet comprises at least one coating. at least one surfactant; wherein the gelatin capsule or the tablet comprises at least one coating. 36. The preconcentrate according to any of claims 24-35, wherein the at least one coating is chosen from enteric coatings, sub-layers, top-layers, and combinations thereof. 37. The preconcentrate according to claim 36, wherein the gelatin capsule comprises at least one enteric coating. 38. The preconcentrate according to claim 36, wherein the gelatin capsule comprises at least one enteric coating and at least one top-layer above the enteric coating. 39. The preconcentrate according to claim 37, wherein the gelatin capsule comprises at least one enteric coating and at least one sub-layer between the gelatin capsule wall and the enteric coating. 40. The preconcentrate according to claim 39, wherein the at least one sublayer comprises a sealant. 41. The preconcentrate according to claim 39, wherein the gelatin capsule further comprises at least one top-layer above the enteric coating. 42. The preconcentrate according to claim 36, wherein the tablet comprises at least one enteric coating. 43. The preconcentrate according to claim 36, wherein the tablet comprises at least one enteric coating and at least one top-layer above the enteric coating. 44. The preconcentrate according to claim 36, wherein the tablet comprises at least one enteric coating and at least one sub-layer between the tablet surface and the enteric coating. 45. The preconcentrate according to claim 43, wherein at least one sub-layer comprises a sealant. 46. The preconcentrate according to claim 43, wherein the tablet further comprises at least one top-layer above the enteric coating. 47. The preconcentrate according to claim any of claims 24-35, wherein the at least one coating comprises at least one material chosen from gelatin, film-forming agents, polymers and copolymers. methacrylate, copolymers between metacrylic acid and ethyl acrylate, cellulose acetate phthalate, hydroxypropyl methyl cellulose phthalate, hydroxypropyl methyl cellulose acetate succinate, polyvinyl acetate phthalate, and mixtures thereof. 49. The preconcentrate according to claim any of claims 24-35, wherein the at least one coating is pH-dependent or pH-independent. 50. The preconcentrate according to claim any of claims 24-35, wherein the at least one coating comprises at least one plasticizer. 51. The preconcentrate according to claim 50, wherein the at least one plasticizer is chosen from triethyl citrate, triacetin, polyethylene glycol, propylene glycol, phthalates, sorbitol, glycerin, and mixtures thereof. 52. The preconcentrate according to claim any of claims 24-35, wherein the gelatin capsule is a hard capsule or a soft capsule. 53. The preconcentrate according to claim any of claims 24-35, wherein the gelatin capsule fill content ranges from about 0.400 g to about 1.300 g.
54. The preconcentrate according to claim 53, wherein the gelatin capsule fill content ranges from about 0.600 g to about 1 .200 g.
55. The preconcentrate according to claim 54, wherein the gelatin capsule fill content ranges from about 0.800 g to about 1.000 g.
56. The preconcentrate according to claim any of claims 24-35, wherein the gelatin capsule or tablet releases less than 30% of the total EPA and DHA in the stomach. 57. The preconcentrate according to any of claims 24, 29, 31 , and 33-35, wherein the at least one surfactant is chosen from polysorbate 20, polysorbate 40, polysorbate 60, polysorbate 80, and mixtures thereof. 58. A self-nanoemulsifying drug delivery system (SNEDDS), self- microemulsifying drug delivery system (SMEDDS), or self-emulsifying drug delivery system (SEDDS) comprising a pharmaceutical preconcentrate according to any of claims 24-32, wherein the preconcentrate forms an emulsion in an aqueous solution. 59. A method of treating at least one health problem in a subject in need thereof comprising administering to the subject a pharmaceutical preconcentrate according to any of claims 24-32, wherein the at least one health problem is chosen from irregular plasma lipid levels, cardiovascular functions, immune functions, visual functions, insulin action, neuronal development, heart failure, and post myocardial infarction. 60. A pharmaceutical composition in a gelatin capsule or a tablet form comprising a fatty acid oil mixture comprising at least 75% eicosapentaenoic acid (EPA) and docosahexaenoic acid (DHA), by weight of the fatty acid oil mixture, wherein the EPA and DHA are in a form chosen from ethyl ester and triglyceride, and at least one free fatty acid, wherein the gelatin capsule or the tablet comprises at least one coating, for the treatment of at least one health problem chosen from irregular plasma lipid levels, cardiovascular functions, immune functions, visual functions, insulin action, neuronal development, heart failure, and post myocardial infarction. (EPA) and docosahexaenoic acid (DHA), by weight of the fatty acid oil mixture, wherein the EPA and DHA are in a form chosen from ethyl ester and triglyceride, at least one free fatty acid, and at least one surfactant, wherein the gelatin capsule or the tablet comprises at least one coating, for the treatment of at least one health problem chosen from irregular plasma lipid levels, cardiovascular functions, immune functions, visual functions, insulin action, neuronal development, heart failure, and post myocardial infarction. eicosapentaenoic acid (EPA) and docosahexaenoic acid (DHA), by weight of the fatty acid oil mixture, wherein the EPA and DHA are in a form chosen from ethyl ester and triglyceride, at least one free fatty acid, and at least one surfactant, wherein the gelatin capsule or the tablet comprises at least one coating, and wherein the preconcentrate forms an emulsion in an aqueous solution, for the treatment of at least one health problem chosen from irregular plasma lipid levels, cardiovascular functions, immune functions, visual functions, insulin action, neuronal development, heart failure, and post myocardial infarction. 63. A pharmaceutical preconcentrate in a gelatin capsule or a tablet form comprising a fatty acid oil mixture comprising at least 75% eicosapentaenoic acid (EPA) and docosahexaenoic acid (DHA), by weight of the fatty acid oil mixture, wherein the EPA and DHA are in free acid form and at least one surfactant, wherein the gelatin capsule or the tablet comprises at least one coating, for the treatment of at least one health problem chosen from irregular plasma lipid levels, cardiovascular functions, immune functions, visual functions, insulin action, neuronal development, heart failure, and post myocardial infarction. docosahexaenoic acid (DHA), by weight of the fatty acid oil mixture, wherein the EPA and DHA are in free acid form and at least one surfactantant, wherein the gelatin capsule or the tablet comprises at least one coating, and wherein the preconcentrate forms an emulsion in an aqueous solution, for the treatment of at least one health problem chosen from irregular plasma lipid levels, cardiovascular functions, immune functions, visual functions, insulin action, neuronal development, heart failure, and post myocardial infarction. 65. A pharmaceutical preconcentrate in a gelatin capsule or a tablet form comprising a fatty acid oil mixture comprising at least 75% eicosapentaenoic acid (EPA) and docosahexaenoic acid (DHA), by weight of the fatty acid oil mixture, wherein the EPA and DHA are in a form chosen from ethyl ester and triglyceride and at least one surfactant, wherein the gelatin capsule or the tablet comprises at least one coating, for the treatment of at least one health problem chosen from irregular plasma lipid levels, cardiovascular functions, immune functions, visual functions, insulin action, neuronal development, heart failure, and post myocardial infarction. 66. A self-nanoemulsifying drug delivery system (SNEDDS), self- microemulsifying drug delivery system (SMEDDS), or self-emulsifying drug delivery system (SEDDS) comprising a pharmaceutical preconcentrate comprising: a fatty acid oil mixture comprising at least 75% eicosapentaenoic acid (EPA) and docosahexaenoic acid (DHA), by weight of the fatty acid oil mixture, wherein the EPA and DHA are in a form chosen from ethyl ester and triglyceride, and at least one surfactant, wherein the gelatin capsule or the tablet comprises at least one coating, and wherein the preconcentrate forms an emulsion in an aqueous solution, for the treatment of at least one health problem chosen from irregular plasma lipid levels, cardiovascular functions, immune functions, visual functions, insulin action, neuronal development, heart failure, and post myocardial infarction. 67. The preconcentrate according to any of claims 61 , 63, and 65, wherein the at least one surfactant is chosen from polysorbate 20, polysorbate 40, polysorbate 60, polysorbate 80, and mixtures thereof. DE69013923D1 (en) * 1989-08-17 1994-12-08 Cortecs Ltd Pharmaceutical formulations.